The biggest and most comprehensive coverage of Taiwan's cherry blossom season is finally here! It includes a real-time forecast table that tells you, if there are still lots of cherry blossoms to see on a particular place. Hailed as the “mother of all Taiwan cherry blossoms post”, this is the most complete travel guide that you will ever find, about Taiwan’s various sakura viewing spots. From Taipei to Alishan, all of your questions about the island’s festive flower season are now answered on this ultimate Taiwan cherry blossom guide. 1.1. When is Taiwan's cherry blossom season? 1.2. Which month is the best time to see the sakura in Taiwan? Is it February or March? 1.3. What are the best places to visit to see cherry blossoms in Taiwan? 1.4. How long does the flowers of the cherry blossom last? 1.5. Do all of the Taiwan cherry blossom viewing spots are accessible by public transportation? 1.6. Does the government of Taiwan release an official cherry blossom forecast? 1.1 When is Taiwan's cherry blossom season? A: Taiwan's cherry blossom season starts in January and ends in April. It is a common misconception that the flower season happens in spring during February and March. As early as the first week of January during winter, a few trees would start to have flowers. Pingjing St. Lane 42, is usually the place to watch out for after the New Year had begun. The type of cherry blossom and the location of the trees is also big factor for their blossoming periods. Take for example Alishan Scenic Area, the cherry blossoms here are the Tokyo sakura type. Alishan's climate is perfect for growing this kind of flowers. They blossom in late March to early April, when the weather in the scenic area have shifted from the chilly winter mode to a lovely spring. Among the cities in Taiwan, Taipei is the first to witness the pink of the beauty of the flowers every mid-January and will continue until March. As the weather warms up, the flower party will continue to the low-lying areas of Taichung, not to mention Heping District's Wuling Farm which usually reach its peak every February 20. The first week of April is the last chance for sakura chasers to see the blossoms in Alishan, which is located in Chiayi County. If you are coming from Taipei, you have to spend time and money if you want to see the Tokyo sakuras there. Visiting Alishan during mid-April is considered late for cherry blossom viewing, so plan your itinerary well. The one-man team luomujie blog is here to help you, just in case you can't decide on which place to see for your cherry blossom hunting in Taiwan. 1.2 Which month is the best time to see the sakura in Taiwan? Is it February or March? A: I will say both. I will even add January and April for the best months to visit Taiwan during its entire cherry blossom season. Each month and each province/city on the island have their own sakura viewing spot that is worth visiting. In January, there is Pingjing St. Lane 42 and Wulai Scenic Area. These places are the early bloomers and reach their peak during the end of the month. For February, Wuling Farm is waiting for you. Visitors can also go to the backyard of Tianyuan Temple, Broadwood Park, and the Shenzhang Bridge bus stop in New Taipei . The month of March is a wild animal. Climate change had disrupted the blossoming patterns of the sakuras in Yangmingshan. The flowers there usually appear in February. Now, the sakuras blossom in March breaking the norms of what it was used to be. Expect the showa and yoshino sakura to appear during this month with the cherry stream area, the Yangming Park fountain, Yangmingshan Visitor Center and Yangmingshan Park Service Center bus stop as the best places to gaze at the flowers. In New Taipei, the Tianyuan Palace is the hotspot every March while Sun Link Sea in Nantou is the next big thing after the Wuling Farm cherry blossom festival has ended. Other places like the Loving Farm in Lalashan are also worth to see. But with no public transportation to take people directly to the place, visiting them would take too much time and money. Taichung offers an alternative to those who had been to Yangmingshan. Near TRA Tai'an Station is a police headquarters where people flock to enjoy yaesakura cherry blossoms. While in Nantou, tourists at the Formosan Aboriginal Culture Village enjoy looking down on the pink forest composed of sakura flowers, as they fly in the sky through a thrilling cable car ride. April? There's no better answer but Alishan. Visitors can expect the Tokyo cherry blossoms to appear during the first week of April. The sakura festival in Alishan varies in time depending on the climate condition, but expect the flowers to start appearing from the first week of March to as late as the first half of the month. You can see different kinds of cherry blossoms in Alishan with the Tokyo sakura being the most important. It usually blossoms on late-March to early-April. Alishan is located on the mountains of Southern Taiwan at an altitude of more than 2,000 meters. If you are coming from Taipei, prepare to travel for 6 hours just to reach the scenic area. 1.3 What are the best places to visit to see the cherry blossoms in Taiwan? 1.4 How long does the flowers of the cherry blossom last? A: The flowers have a lifespan of 7 to 10 days only. 14 days will be its maximum beauty when you consider the time the first buds open until the petals start to wither and blown away by the wind. 1.5 Do all of the Taiwan cherry blossom viewing spots accessible by public transportation? A: Unfortunately, the answer is a big no. While popular sites like Yangmingshan and Alishan can be reached via bus, some places especially those located in the lesser known mountains of Taiwan can only be reached by driving your own car. One example is the Lalashan Loving Farm and its 70-km distance from TRA Taoyuan Station. And from the nearest bus stop in Fuxing District which is called Shangbaling, this cherry blossom viewing spot is still 3.7 kilometers away! Tripool taxi, an officially recognized private transportation by Taiwan's Tourism Bureau is here to solve your problem. Try to check their web app: https://www.tripool.app/?utm_source=luomuji and get to know about their 40% off deal. 1.6 Does the government of Taiwan release an official cherry blossom forecast? A: No. In my five years of stay in Taiwan as a PhD student, I have observed that Taiwan's national government don't release any data about the expected dates blossoming of its sakura flowers. Usually, it's the meteorological agency of a country that gives such data. For Korea, it's the Korea Meteorological Agency and for Japan, it's the Japan Meteorological Agency (JMA). These institutions release a map of their respective nation together with the blossoming periods of the flowers. Taiwan's very own Central Weather Bureau (CWB) is the equivalent of the KMA and JMA, but it doesn't release information about sakura. I can only give an intelligent guess on why the CWB don't tell any sakura forecast. That it's up to the local government units, scenic area administrations and private farms to disseminate information about their own cherry blossom festivals. Luckily, for Taipei, the city government updates everyone through its own sakura website: http://flowers.taipei/sakura/. It is currently offline but through that page, tourists will be able to know the current situation of the sakura trees located in different parks across the city, and their blossoming rates (defined by percentages). I tried following that site for years and I found myself looking for pink petals at Wenshan District, Songshan District and Shilin District, but sometimes I went home disappointed because I only saw a few flowers. Haha! In my opinion, some of the data there are exaggerated. I'm not saying that you do not follow the Taipei's recommended site for cherry blossom viewing. Just lower your expectations if you are not going to Yangmingshan or to other popular sakura spots in the city. To help you have a memorable cherry blossom trip before you even arrived on Taiwan, the one-man team luomujie blog created this 2019 Taiwan Cherry Blossom Forecast. From Taipei to Alishan, visitors will now be updated about the hottest place to go for cherry blossom viewing. The different sakura viewing spots are organized by city and each place is represented by a colored bar. The length of the rectangles represent the expected time when you will see best the flowers. Just hover your mouse and click the bar. You will know then the right dates to go to that place. Expect places like Yangmingshan and Alishan to have longer bars because of the variety of flowers that these parks have. What's the basis of my predictions? It’s experience! Years of sakura hunting taught me that there are patterns, when it comes to the blossoming periods of Taiwan's cherry blossoms. Living on this country for a half a decade, I am now familiar with the different weather cycles in Taiwan and its effect on the pink petals. But I still recognize the fact, that it's difficult to accurately predict when will the flowers appear, so I made the table dynamic. The bars will lengthen,shorten or even change position according to real-time data. Complementing the luomujie blog's 2019 Taiwan Cherry Blossom Forecast, is this latest update report about the flowering rate of the cherry blossom trees, on the different sakura viewing spots in Taiwan. The blossoming conditions is described by the % rate of flowering and if possible, a note will be added to add more information about the actual situation on the place. I have two tables, the first one is the Top 10 Cherry Blossom Viewing Spots. These are the popular places in Taiwan to see the sakura flowers and usually accessible by public transportation. Wulai late January to early February See you in 2020! Pingjing St. Lane 42 late January to early February See you in 2020! Wuling Farm mid-February to late February See you in 2020! and between mid-March to late March See you in 2020! Yangmingshan mid-February to mid-March See you in 2020! Chiang-kai Shek Memorial Hall mid-February to early March See you in 2020! Formosan Aboriginal Culture Village late February to mid-March See you in 2020! Lalashan Loving Farm early March to mid-March See you in 2020! Sun Moon Lake Ropeway early March to mid-March See you in 2020! Alishan early March to early April See you in 2020! The second table is about the other places to see cherry blossoms in Taiwan. It includes common cherry blossom viewing spots in Greater Taipei and other cities of this country. Current flowering situation of different cherry blossom viewing spots around Taiwan. Those already in the Top 10 Cherry Blossom Viewing Spots are excluded on this table. Taipei Taipei Flower Test Center See you in 2020! Broadwood Park See you in 2020! Taipei 101 See you in 2020! Sun-yat Sen Memorial Hall See you in 2020! Neihu Creek Trail See you in 2020! Bishanyan See you in 2020! Orange Cafe restaurant See you in 2020! Neicou Stream See you in 2020! Dongfang Temple See you in 2020! New Taipei Yinghua Park See you in 2020! Kao Gao Keng Creek See you in 2020! New Garden City See you in 2020! Xiong Kong Cherry Blossom Forest See you in 2020! Sunshine Sports Park See you in 2020! Royal Dragon Sakura Forest See you in 2020! Shulin Land Office See you in 2020! Lung Yen Mobile Sakura Forest See you in 2020! Hope River See you in 2020! Wugu District See you in 2020! Sanzhi Sansei Trail See you in 2020! Hsinchu Hsinchu Park See you in 2020! Miaoli Tongluo Firecracker Flower Garden See you in 2020! Nantou Caopingtou See you in 2020! Shanlinxi See you in 2020! Taichung Tai'an Police Station See you in 2020! Cherry Hill Slope See you in 2020! Dongshi Forest Park See you in 2020! Wun Chang Elementary School See you in 2020! For the 9-day Chinese New Year Holiday in Taiwan which will start from Feb. 2 and will end on Feb. 10, services of the different modes of public transportation in Taiwan will be reduced. The usual 20-minute waiting time for low-floor buses might become one hour. Likewise, the intervals between trains of the MRT and the TRA will also become longer. Based on my experience, bus stops in Taiwan are usually posted with short pieces of paper containing information about their new schedule. Services of tripool taxi is also suspended during the 9-day holiday period. Prospective passengers will not be able to book a trip for dates falling from Feb. 2 to 10. Going back to the 2019 Taiwan Cherry Blossom Forecast dynamic table, several sakura viewing spots will be affected by the affected by Chinese New Year holiday. They are Pingjing St. Lane 42 (Bus 303 schedule from MRT Jiantan Station for Feb. 4 to 9 has been posted in the Suggested Itinerary Section), Taipei Flower Test Center, Tianyuan Temple, Wulai, Yinghua Park, Kao Gao Keng Creek, New Garden City, Caopingtou, Wuling Farm and Alishan. Travellers must take note of this to avoid inconvenience in waiting for the buses for too long. I suggests that you should avoid visiting Caopingtou during this period if you will not drive your own car. Adding spice to the cherry blossom season of Taiwan is this set of travel itineraries arranged and set up according to the current flowering situation. Right now, Pingjing St. Lane 42 and Tianyuan Temple are best places to go before the Lunar New Year Holiday. The sakuras in Broadwood Park in Neihu might need more time to reach full bloom. Expect more travel itineraries on this section as the Taiwan's cherry blossom season intensifies. Strawberry picking bundled with cherry blossom viewing. I know you will enjoy harvesting fresh strawberries and putting them in your basket. I know one farm and it opens at 9:00 am every Saturday (The link for its exact location can be found on the summary table for the transportations for the suggested itineraries.) If you go on any other day, you might not be able to pick the fruits. I tried talking to other farmers and they have the same system: farms are open every Saturday and then close for the rest of the week to give time for the fruits to grow and mature. Suggested tripool taxi itinerary on visiting the Taipei strawberry farm, Pingjing St. Lane 42, National Palace Museum and Shilin Night Market in one day. The strawberry farm opens its doors to tourists every Saturday at 9:00 am only. Adjust your pick-up times and the itinerary if you are planning to go from Sunday to Friday. The Diary of Taipei Hotel - Ximen Station is for reference only, you can type in the web app the hotel name of your choice. Users must also type the Chinese name of the strawberry farm in the web app. If you can't write Chinese, just copy the word from the text box below. If you're using a desktop or laptop computer, highlight the word then press CTRL-C to copy and CTRL-V to paste. For smartphone users, make a long tap first on the text box, then use the "cursors" to highlight the Chinese word and then copy. Meteor Garden fans will be delighted to know that they don't have to go to Chiayi to feel again the magic of the famous Taiwanese drama. Tamkang University in Tamsui offers an alternative place to see one of the TV show's filming location. And with the blossoming of the cherry blossoms in Tianyuan Temple, visitors can just ride the low-floor buses going to the place from MRT Tamsui Station and have fun taking pictures with the tri-color sakura. Travelling only in Taipei? Don't have time to go to Wuling Farm? Don't worry because here is your suggested itinerary for your Taipei cherry blossom viewing trip. Designed for tourists visiting the capital between Feb. 11 to Feb. 25, you can now see the sakuras in the city. Gaze your eyes at Taipei 101 while looking at the cherry blossoms. Go to the pond area of the Sun-yat Sen Memorial Hall and have some selfies with the kawazu sakura. The flowers at Yangmingshan Park are now open and they are increasing in numbers day by day, while LOHAS Park/Broadwood Park at Neihu District had been waiting for you a very long time. Mix and match these places, start either with Yangmingshan or check the Broadwood Park/Lohas Park for a romantic cherry blossom night experience. Taipei Main Station (Blue Line/Red Line) -> Bus 260 -> get off at the bus terminal -> transfer to the shuttle bus going to Yangmingshan Park. Suggested tripool taxi itinerary on visiting the cherry blossoms at Sun-yat Sen Memorial Hall, Broadwood Park/LOHAS Park, Yangmingshan and near Taipei 101 (Citibank Department of Business Branch). The Diary of Taipei Hotel - Ximen Station is for reference only, you can type in the web app the hotel name of your choice. Check the traffic control dates at Yangmingshan on Section 4.4 before booking a tripool taxi ride. To ease congestion on the roads leading to Yangmingshan National Park, traffic control will be implemented on weekends and during the 228 holiday season. Visitors wishing to see the cherry blossoms at Yangming Park are advised to board the public bases from specific MRT Station along the Red Line. For those who prefer to visit the park by taxi or private cars, I suggest visiting the park during weekdays. If you are going to visit on weekends, expect large crowds of people to join you in your cherry blossom hunting. When will be the traffic control at Yangmingshan be implemented? The annual Tulips Festival at Taipei's Shilin Official Residence had its kick off last Feb. 21 and will run until March 3. Visitors planning to see Yangmingshan Park for cherry blossom viewing, can make a stop first at MRT Shilin Station, for a short walk to the former mansion and garden complex of Chiang-kai Shek. A variety of tulips await tourists this year with an indoor visit of Taiwan's amazing orchids. The best part of this flower show is that ADMISSION IS FREE! So hurry before the tulips are gone. The Formosan Aboriginal Culture Village is one of the best places to see cherry blossoms in Taiwan. Most of the sakuras there are not the pink type but rather the reddish yaesakura variety. It's the multi-petalled cherry blossom that during its peak of flowering, showers the entire theme park with happiness. Hop into one of the cable cars of the Sun Moon Lake Ropeway and have a thrilling ride as you travel from Ita Thao to the entrance of the tourist spot. Look outside the windows as you fly, and gaze your eyes to the mystical pink forest down below that are composed of the cherry blossom trees. 1. Package does not include lunch. Much to the delight of visitors who want to see the cherry blossoms at the Tai'an Police Station, and explore Central Taiwan's famous tourist attractions like Gaomei Wetlands and the ongoing Taichung World Flora Exposition, you can now have a wonderful and hassle-free trip in Taichung with tripool taxi. Don't waste your time walking for 3 kilometers from the police station to Zhongshe Flower Farm, book your ride now and arrive on time at the sightseeing farm. The sunset at Gaomei Wetlands happens around 10 minutes before or after 6:00 pm, so it's better to leave Houli Station at 3:30 pm and still have some time to dip your feet and feel the cool waters of Taichung's coast. Before you leave city and board the HSR train back to Taipei, check the Miyahara ice cream shop and have fun taking pictures imagining like you are inside a magical world. Suggested tripool taxi itinerary on seeing the cherry blossoms at Tai'an Police Station and then visiting the Zhongshe Flower Farm, the Taichung World Flora Exposition at Houli Station, Gaomei Wetlands and Miyahara. If you want to follow this itinerary, you should make 6 separate bookings in the tripool web app for each pick-up point - drop-off point pair. Travel along the MRT Green Line and see the tairyo cherry blossoms at Chiang-kai Shek Memorial Hall. Shop till you drop at Ximending and gaze your eyes at the colorful graffiti on its secret corners. Whether you just go for window shopping or art appreciation in Ximending, a visit in Taipei won't be complete without a gastronomic adventure in Yongkang Street via Dongmen Station. From beef noodles to shaved ice desserts, all of your cravings will be fulfilled here. At night, witness Bitan's fountain before you go to Raohe Night Market to buy some food for your midnight snacks. Travel on a tripool taxi car to see the explosion of yoshino sakura in Tianyuan Temple and nearby cherry blossom spots. Don't waste your time waiting for the bus. Visit each place at ease, hop-on and hop off at a tripool taxi car and experience having your own personal driver for a day. With the exception of Orange Cafe restaurant (the staff also limits the number of people who can enter the garden), all of the cherry blossom spots listed on the tripool taxi below are free to enter. Orange Cafe charges NTD 100 per person for the entrance ticket. If the queue is too long, visitors can make a leisurely stroll to Neicou Stream Trail as an alternative. Book a trip during weekdays and non-holidays in Taiwan to avoid the large crowd that will spoil your cherry blossom viewing adventure. Suggested tripool taxi itinerary on seeing the cherry blossoms at Tianyuan Temple, Sanzhi Sansei Trail, Orange Cafe restaurant and Dongfang Temple, with a final stop at Shilin Night Market before going back to Diary of Taipei - Ximending hostel. If you want to follow this itinerary, you should make 6 separate bookings in the tripool web app for each pick-up point - drop-off point pair. The Diary of Taipei Hotel - Ximen Station is for reference only, you can type in the web app the hotel name of your choice. *Note: For Sanzhi Sansei Trail and Orange Cafe, the names of the places in the web app are in Chinese. If you can't write Chinese, just copy the word from the given text box. If you're using a desktop or laptop computer, highlight the word then press CTRL-C to copy and CTRL-V to paste. For smartphone users, make a long tap first on the text box, then use the "cursors" to highlight the Chinese word and then copy. Taichung is an emerging cherry blossom viewing spot in Taiwan. It is no wonder that people who visit Taipei will also want to see the biggest city in Central Taiwan. After getting off from the HSR Taichung Station, tourists will ride the local trains of the TRA to get to downtown or board a taxi to take them to the popular tourist attractions. Locals rely on public buses to reach the different corners of Taichung so travelling here is a bit difficult. Unlike Taipei which has a vast of network of MRT lines, Taichung is still on a construction phase of its own MRT network. So, international visitors will have to ride taxis to maximize their time here. There are a plethora of yellow cabs offering their services to tourists ranging from NTD 3,500 to NTD 5,000 for an 8-hour day tour, but tripool taxi gives its prospective customers more flexibility and a cheaper price with no hidden charges. Thanks to its through its easy to use web app. Take a look at the suggested 1-day itinerary table below. Top attractions like the Xinshe Castle, Zhongshe Sightseeing Flower Market and Rainbow Village are included. Suggested tripool taxi itinerary for a 1-day Taichung tour. The trip will start and end at HSR Taichung Station and the following places will be visited along the way: Chungshe Tourism Flower Market, Xinshe Castle, Rainbow Village, Miyahara. Prospective passengers must make five separate bookings in the web app for each pick-up point - drop-off point pair. The table below is the summary of all the transportation options for the suggested itineraries that I have listed above. Expect the table to grow as more sakuras blosssom around Taiwan. To help sakura chasers find their way to the cherry blossom trees, I have created this sakura map together with other tourist attractions and maple viewing locations in Taiwan. All the points in the map whether its a maple, sakura or plain tourist attraction are the places that I have visited personally. This map will be a big help to you, especially if you got lost in the mountains. Just open the map in your smartphone through Google Maps or Chrome and you will know how far you are from the cherry blossom spots. There are links on each sakura point and they will bring you back to each specific topic of this ultimate Taiwan cherry blossom guide. Every year, the highlight of the Sakura Series is a visit to Wuling Farm. The home of Taiwan's landlocked salmon is also a paradise of thousands of cherry blossom trees. If you really want to see a massive number of blossoming sakura in Taiwan, then Wuling Farm is the place to you need to go. But before you get too excited and see to this place, let me tell you a few things about the Wuling Farm Cherry Blossom Festival. 1. 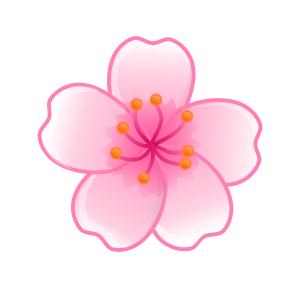 There is an official period for celebrating the cherry blossom festival. For 2019, it will be from Feb. 7 to 27. During this period, there will be traffic control and lots of public buses will bring people to Wuling Farm, and back to Taipei or Yilan on the same day. By the way, the farm is located in Taichung City's Heping District. Look at the image below and assess yourself if you can travel for 4 hours just to reach the farm. Having been to Wuling Farm many times. I was even able to camp there! I have discovered that it is possible to ride the buses coming from Yilan and return on the same day. But there is a caveat! You won't be able to see all the sakura trees in the scenic area. You can only roam around the parks in front of the Visitor Information Center. If you board Bus 1751 and 1764 at Yilan Transfer Station, you will arrive in Wuling Farm after 3 hours. These vehicles will return to Wuling Farm to fetch passengers at 1:30 pm and 2:30 pm. So it is possible to wander in the farm from maybe 11:00 am to 2:30 pm. Three hours for a budget travel. Not that bad! I highly recommended doing this technique during the off-season. Ex. maple/autumn season. There are just too many people during the sakura festival. It will be difficult to get seats especially on weekends and holidays. Travelling on a group? I suggests boarding tripool taxi so you can maximize your stay in the park. This private car service is perfect for visitors travelling with a baby, elderly or groups of people who are not comfortable riding buses that are full of passengers. Price comparisons of one-way fares in tripool taxi going to Wuling Farm. Up to a maximum of 8 passengers can be book in one ride. 2. There is a limit on the number of people that can visit Wuling Farm everyday during the cherry blossom season. For people coming from Taipei only 2,000 sakura fans can join the fun and I was one of the lucky people that were able to see the cherry blossoms. I bought the round trip ticket at Taipei City Hall Bus Station for a price of NTD 730, a night before my trip. The ticket also includes the entrance fee to Wuling Farm. This is Taiwan's way of controlling the number of people visiting the farm which I found to be very effective. start on Jan. 17, 2019 0:00.
,Family Mart and Hi-Life convenience stores. A maximum of 4 tickets can be bought by one person. Tickets can also be bought at the designated bus counters at Taipei Bus Station and also at Yilan Rail Transfer Station. One should take note, to buy the tickets as early as possible because of the large number of people who wants to visit Wuling Farm during the festival period. Tickets can also be bought at convenience stores which I didn't do because I can't read Chinese. For a non-Mandarin speaker, it was better for me to just buy the tickets at the bus station and tell the lady at the counter 'Wuling Farm'. I was given the 7:00 am ticket and I was told to be in the Platform 16 of the Taipei City Hall Bus Station at 6:50 am. Take note of your seat number, and before boarding the bus I was given a card with a 16:00 written on it. This is the return time of the bus at Wuling Farm. You will need to present this card before you enter the bus again and sit on the same seat during the return trip. 3. Snow has a bad effect on the blooming of the cherry blossoms. When it snows, cherry blossoms buds can experience frostbite and will not flower anymore. A lot of people are delighted whenever it is snowing in Taiwan, but little that they know that it's not good to the island's agriculture and also to the cherry blossom trees. In the past, lots of people became disappointed because they saw less cherry blossom flowers, after it snowed. Based on my research, when there is an El Niño phenomenon, anticipate not much pink petals of the sakura. 4. On rare occasions, Wuling Farm can extend the official cherry blossom to March. Well, it all depends on the current flowering situation. When is the best time to see the cherry blossoms in Wuling Farm? It is Feb. 20. On my first trip, I was not convinced of the photos that I saw in Wuling Farm's facebook page. So I decided to visit the farm on Feb. 28 which happened to be a good day to see cherry blossoms. The sun was up with the freezing wind to cool the visitors. The cherry blossoms actually started to blossom around Feb. 20 that time and the flowers would last 8 to 10 days. Really possible to extend the festival period until March. 5. 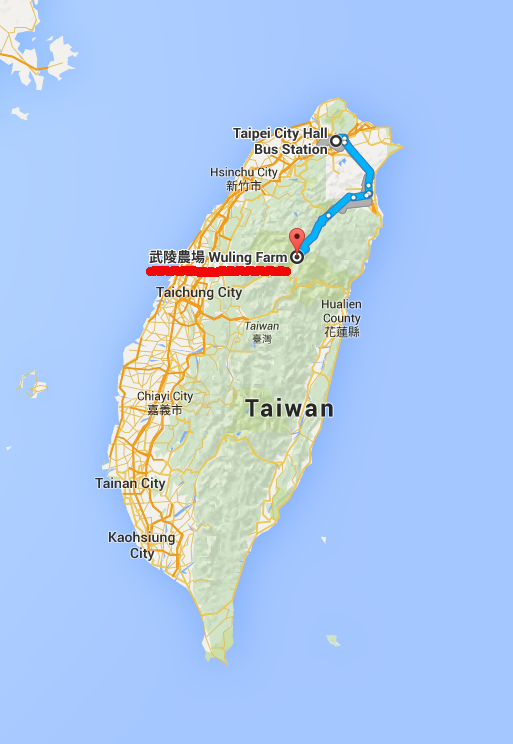 It took 4 hours to reach Wuling Farm from Taipei City Hall Bus Station. There is a toilet break so you don't have to worry if you experience a call of nature, but remember to memorize the plate number of your bus. There might be 10 to 15 buses park at the same time during the break and they all look the same. To be safe, I took a photo of its plate number. Visitors must also bring their own food. I brought bread and water as my lunch and snacks. When I was already wandering in the farm, I heard a woman selling a lunch box and I bought it for NTD 100. Haha! It was really a lucky day. There are also restaurants inside Wuling Farm but you need to walk for a long distance. 6. There is a standard cherry blossom viewing route in Wuling Farm. It starts from where the bus would drop you off which is the peach farm area, and visitors will have to walk back to the parking lot (the bus will bypass this area!) to board the same bus for the return trip. As you walk along Wuling Road, you will be mesmerized by thousands of pink flowers. This is what happened during my first visit in Wuling Farm: The bus entered the scenic area and I was expecting it to stop at the Wuling Farm bus stop. It went inside deeper into the farm and it made its final stop at the Peach Garden where all the passengers alighted. After that the bus went directly to the other end of the farm. While I was already taking a lot of photos along the road I suddenly saw my bus through its plate number, and it was already going in the opposite direction. All buses will have to make a U-turn at the end of the Wuling Road, and will wait at First Parking Lot near the Sheipa Pa National Park Wuling Farm Visitor Information Center. 7. After getting off the bus, start your sakura adventure at the Peach Garden. I decided to go into the direction where my bus, until I saw see a large number of cherry blossom trees. Most visitors also walked along the Wuling Road. Along the way, you might even see the Wuling Farm sightseeing bus. This vehicle is for roaming around the entire farm. Usually, visitors staying overnight avail of this service. 8. Sometimes, Wuling Road have restricted areas that visitors will have to make short ride on a bus. I was actually going to the Tea Garden Trail and the guy told me something in Chinese and I heard him mentioned the word 'cha'. I eventually got what he wanted to say so I joined the long queue. He speaks a little English but thanks to my research about the best cherry blossom viewing spots in Wuling Farm, I already have an idea of what he was trying to say. After waiting for a few minutes, a big bus came and tourists enjoyed a two minute ride to the entrance of the Tea Garden Trail. 'Cha' actually means "tea" in English. 9. The Tea Garden Trail is a short path but it will give you fantastic views of the other cherry blossom trees in Wuling Farm. There was a pagoda on a top of the hill and visitors also has a chance to see the entire tea plantation. The Tea Garden Trail is one of the best places to see the pink flowers in Wuling Farm. 10. You will need to walk for 15 minutes from the entrance of the Tea Garden Trail to reach the parking area, where there lots of Guoguang buses are waiting for their passengers. The parking lot of the Sheipa National Park Wuling Farm Visitor Information Center has a cherry blossom forest which hides another big parking space. My Capital Tour bus was actually parked there and the English speaking staff of Wuling Farm who were handling the traffic gave me simple instructions to see my bus. It was really helpful that I photo of its plate number. My first visit to Wuling Farm became successful and I'm always wishing to go back to here again. After the trip, I told everyone the joy I had when I saw the cherry blossoms in Wuling Farm. Haha! Wuling Farm. The luomujie blog's top pick for cherry blossom in Taiwan is here again in the Sakura Series. Having visited the place twice made it easier for me to invite past Travel Buddies who had been missing in action for years. They were Robert and Sanjoy and the two were very excited to see the recreational farm for the first time. On my first trip, I made a travelogue on what to do and what to expect in Wuling Farm. It fueled the interest of my readers especially Filipinos who are dying to see the beautiful flowers of the Wuling cherry. A lot of them raised questions about how to get tickets. Since I live here in my beloved Taiwan, it was easy for me to go to Taipei City Hall Bus Station and buy three tickets. The price of NTD 730 was very cheap on Taiwanese standards which includes the roundtrip fare to Wuling Farm from Taipei and its entrance fee. The technique that I have mentioned is only valid for those people who are living in Taiwan. Those who need to enter Taiwan first will have to get tickets from travel agencies, in which the ticket prices have been doubled or sometimes more. Unless you know someone in Taipei, then your friend can buy you the NTD 730 ticket before you arrive on this country. Visitors can also get the tickets in 7-eleven but I bet that you won't like the travel dates that their kiosk would offer. The freedom to choose the travel dates will always be at the designated ticketing centers like Taipei Bus Station, Taipei City Hall Bus Station, and Yilan Transfer Station. The 6,000 daily visitor limit has been distributed well among bus companies and visitors must take advantage of the good weather when choosing the right date to see the farm. February 17 was the perfect day to have the adventure. The Central Weather Bureau's forecast on that day says that it would be sunny. At 60-70% of blooming status, the flowers will look fresh under the blue sky. A cold front was predicted to pass Taiwan after February 20 bringing rain and strong wind that can blow away the precious petals of the cherry blossoms so Feb. 17 was a very good choice. My Travel Buddies and I did not have enough sleep just to be Taipei City Hall Bus Station early in the morning. Our bus left Taipei at 6:15 am and traffic in the mountains delayed our arrival by 15 minutes. The four-hour travel to the Wuling Farm was worth it, although I have observed some changes with regards to this year's festival. The official visiting period of Feb. 16 to 25 was shorter compared to the previous editions. Last year, the blossoming of the flowers was very early so the traffic restrictions in the farm happened at the start of February. The recent snowfall around the dates of Feb. 4 or 5 caused a dilemma for sakura fans. Many feared that the buds that are just starting to appear would die due to frostbite. And they did! As expected, the flowers were less compared to last year. We can't do anything about that because everything is in the hands of the Taiwan gods. Snow brings a bundle of joy to Taiwan but not to the cherry blossoms. I am hopeful that next year Taiwan's top cherry blossom viewing spot will be beautiful again. See you again Wuling Farm for another round of the Sakura Series next year. Yangmingshan. Northern Taiwan's only national park offers the best place to see the cherry blossoms in Taipei. The climate on this mountainous region makes it suitable to plant and grow the cherry blossoms. There are an estimated 1,000 cherry blossom trees in the national park. The showa and yoshino being the favorites of the locals, though they don't blossom at the same time. To see most of the flowers, tourists go to Yangmingshan Park. It was a good thing that there is one central place to see the sakuras, because Yangmingshan National Park is a very big place to explore in just one day. I have seen its evolution since the first time I went to this park to see the sakuras in 2014. During that time, the Yangmingshan Cherry Blossom Festival is an event where everyone can see not just cherry blossoms but other colorful flowers as well. The so-called Cherry Stream area is a plain car park before and what's on its place are pots of different kinds of blossoms. Looking at the hills, you can see a sign with big Chinese characters, to remind everyone of the word “Yangmingshan Cherry Blossom Festival” (plus the year). You can see how the event looks like on the next paragraphs about my visits in 2014 and 2015. In 2016, a change was introduced in the Yangmingshan Cherry Blossom Festival. The Cherry Stream area was constructed to add more sakura trees, and to add another permanent site for sakura viewing. Rather than buying flowers and changing them again when they have lost their beauty, planting new trees on one permanent site helped cut the cost of hosting the Yangmingshan Cherry Blossom Festival for the city government. When I always hear the word 'cherry blossoms' I always think of Japan, so I was so excited when I learned that there are cherry blossoms in Taiwan. If you are going to Taipei during spring try to schedule your trip during the "Yangmingshan Flower Festival". The opening day of the cherry blossom festival changes every year and the flowering rate of the sakuras depends on having a cool weather. I've waited until March to visit the Yangmingshan, because during the opening day of the flower festival the cherry blossoms have only blossomed 50% to 70% of its flowers. From Taipei Main Station I boarded Bus 260 to Yangmingshan Parking Lot and then transferred to Bus 130 to get toYangmingshan Park. Because I was alone, I just followed locals when they transferred to the other bus at the terminal. I already made my adventure planning during the Chinese New Year celebration so I knew that Bus 130 will take me to Yangmingshan Park. The temperature was around 22 degrees Celsius during my visit, but I have my jacket inside my bag just in case the temperatures would suddenly go down. It was around 3:00 pm when I arrived at the park. I only have 2 hours to roam around, and at 5:00 pm I knew the place would become colder. There were a lots of tourists during that day. Aside from cherry blossoms there were also other flowers that can be seen. Unfortunately, I don't have a tripod with me so I asked some Taiwanese to take my pictures with the cherry blossoms. The locals were very kind and helpful. One of the main attractions in Yangmingshan Park is the Flower Clock. It is said to ring a tune every 30 minutes but I didn't heard anything. Maybe I was just busy taking pictures. Haha! I have photos of the two kinds of cherry blossoms in Yangmingsha Park. They are the white Osima Cherry and the pink Showa cherry which I really loved. As a Filipino who have seen cherry blossoms for the first time, I cannot believed myself to gaze at the Osima and the Showa sakura. I've always thought that I have to go to Japan just to seem them. But look! I have found them in Taipei. Their flowers have captured the hearts of Taiwanese and foreign visitors, as if they want to take them home. To remember their beauty forever in my mind I will call them, "Taipei Sakura". When does spring begin? Or should I say when does winter end? I remember my first winter in Taipei and it was raining every day. The rains continued for weeks, and then suddenly the temperature started to rise. I knew that a magical event is happening. Cherry blossoms never fails to fascinate people. Their petals radiate with passion, like when a woman is deeply in love with her man. In Taiwan, the mountain cherry blossom trees will be the first to show their flowers in January, followed by other sakura varieties on February. If you are in Taipei, the Yangmingshan Cherry Blossom Festival is the perfect place to see cherry blossoms. It’s accessible by public transportation, just board Bus 260 from Taipei Main Station and enjoy the scenery as the low-floor bus takes you to the mountains. Knowing that there are other cherry blossom viewing spots in Taiwan, I got very excited to see all of them that it gave birth to the luomujie blog's "Sakura Series". My Travel Buddies were very eager to see cherry blossoms at Yangmingshan and they were Aaron James (Filipino) and Fisoliya (Zimbabwean). I was alone when I first saw the cherry blossoms, so I invited friends to join me on my second trip. Because it was Chinese New Year, our bus took an hour to climb the mountain. There was heavy traffic on the road leading to bus terminal of Yangmingshan. Reaching Yangming Park, the place was packed with people, who also wanted to see the pink petals of the cherry blossoms. Becoming hungry won't be a problem because food stalls sprout like flowers in spring. The fountain in Yangming Park was transformed into a pink arena. People of all ages wanted to capture beautiful photos of the cherry blossoms. It was a beautiful battle, as photobombers unintentionally destroy your precious moments. Everyone was quick to take a picture. They knew that the flowers would only live for one week, and soon the petals will drop by one by one. Even before all of them have dropped, green leaves would soon replace them. My Travel Buddies were very satisfied with the pink landscape that they saw. I was also very happy because I was able to explore the other places of Yangming Park. Next year, my two greatest fans will come to Taiwan. They will visit the island nation to see me and explore the place I call home. They will come to see the flowering of the cherry blossoms. They will come at the beginning of spring. To make life easier for tourists, I have compiled photos of each corner of Yangmingshan where you can find the sakura flowers. Showa cherry blossoms surrounding a large fountain at the entrance of Yangming Park. d. MRT Beitou Station: Board Bus 129 and then alight at the Yangmingshan Flower Clock. Newly planted showa sakura trees blossom around the new stream square in Yangming Park. Walk around the park to find larger showa sakura trees that are also in bloom. How to get here: Follow the same directions in going to the Yangmingshan Park Service Center bus stop. Visitors must then climb uphill for a few meters to reach the tourist information center [Google Map]. c. MRT Jiantan Station: Board Bus R5 (or Bus 260 from Taipei Main Station) and alight at the Yangmingshan Terminal Bus Stop. Follow the trail leading to the Yangming Park for less than two kilometers. How to get here: Board Bus 260 from Taipei Main Station or Bus R5 from MRT Jiantan Station. From the Yangmingshan Bus Terminal follow the trail leading to Yangming Park. You will then find Huashan Road. Status of flowering during my visit: Some trees were in full bloom. Others were delayed in opening their flower buds. How to get here: This park [Google Map] is a few meters away from the entrance of Zhongshan Hall. After enjoying the cherry blossoms near the Chungshan Building (中山樓) bus stop, follow the vehicles going up to the mountains of Yangmingshan. You will notice this park with a few sakura trees. Status of flowering during my visit: 90% of the flower buds have opened. Status of flowering during my visit: Only one yoshino tree was in full bloom. The other trees have opened at least 60% of its buds. How to get here: Board Bus 260 from Taipei Main Station or Bus R5 from MRT Jiantan Station. Get off the vehicle at Chungshan Building (中山樓) stop [Google Map]. You will see the cherry blossom trees without even entering the gate of this historic site. One of the most sought after cherry blossom viewing spot in Taiwan is the Alishan Forest Recreation Area. The spring flowers that you will see here in late-March to early April are not the typical mountain cherry nor the showa or yoshino varieties. It will be the Tokyo sakura and seeing this blossoms will make you feel that you are in Japan. Located at an elevation of more than 2,000 meters, going to Alishan is like entering a world. Pine trees and the cool climate all year round, you know that it is very different from Taipei. Known for its Alishan Railway, which runs from Chiayi Station and up to the highest train station in Taiwan, which is called Zhushan Station. Travellers have a chance to watch to see the first light rays shine upon you, from the sunrise observation platform at Zhushan Station. I know most travellers don't have much time to go to Alishan, because it's a 6-hour bus ride from Taipei. Riding the Taiwan High Speed Rail from Taipei Main Station to Chiayi Station will also make your travel more expensive. But if you are planning to visit Taiwan for the second time, then why not give it a try, especially during the Alishan Cherry Blossom Festival. To better serve the needs of foreign tourists and first timers who want to visit the scenic are, I have made a Question and Answer section. Q: When is the 2019 Alishan Cherry Blossom Festival? A: The 2019 Alishan Cherry Blossom Festival will happen from March 9 to April 10. Depending on the weather conditions which affects the opening of the flower buds, the official sakura season can be rescheduled to March 15 to April 15. Q: What should I expect during the Alishan Cherry Blossom Festival period? A: Anticipate a lot of people to visit the scenic area during the official festival period. There will be lots of buses to transport people from the cities in the low-lying areas of Taiwan to Alishan. Going back to downtown Chiayi might be a headache after your cherry blossom adventure. So expect a very long queue when you are going to board the Taiwan Tour Bus back to Chiayi Station. Those people with pre-bought tickets from the convenience stores are given the first priority in boarding the bus. Q: What are the bus numbers that goes to the Alishan Forest Recreation Area from HSR Chiayi Station and TRA Chiayi Station? Q: Do I need to buy tickets in advance if will board the Taiwan Tour Bus from Chiayi Bus Station to go to Alishan? A: Yes. The chance of getting a seat will be almost zero if you don't have a ticket. Q: Where will I buy the bus tickets going to Alishan? A: The ticketing counters are located at the Rear Station of the TRA Chiayi Station. To go there, just go inside the train station, continue walking on the footbridge to reach the back portion of Chiayi Station. Look for the counter of Bus 7322. You can also get the bus tickets at the kiosks (the interface is Chinese!) of convenience stores in Taiwan, but don't expect the staff to speak in English. So you will have to show them the Chinese name of Alishan and the bus numbers that you will need to board: 7329,7329A,7322C and 7322D. Refer to the bus tables mentioned above for your reference. Don't forget to buy a separate ticket for the return trip. The selling of bus tickets online will be available starting on March 1. Q: I failed to get a ticket for the Chiayi Station – Alishan bus! What should I do? A: You can book a trip at tripool taxi at least one day before your trip with a cut-off time every 3:00 pm. To get the most benefit of your service, you should be travelling in a group of 3 or more persons to share the expenses. Set a budget of NTD 570 per person for a group composed of 4 persons while NTD 380 for a set of 8 friends. Price comparisons of one-way fares in tripool taxi going to Alishan. Up to a maximum of 8 passengers can be book in one ride. Q: What kinds of cherry blossom do I expect to see at Alishan? A: There are mountain cherries and the Japanese varieties with the Tokyo sakura as the most popular. The Tokyo cherry blossoms appear during late-March and lasts up to the first few days of April. They blossom when Alishan's sakura season is about to end. Q: I'm now here at Alishan. What do I first need to do? Which place should I go to see cherry blossoms? Do you have a suggested itinerary? A: The popular cherry blossoms viewing spots in Alishan are located at these places: 1) Alishan Ranger Station 2) Alishan House 3) Alishan Police Station 4) the section of the Alishan Forest Railway from Zhaoping Station to the Alishan Police Station 5) Alishan Station 6) Alishan Entrance 7) Alishan Gou Hotel and the 8) Alishan Magnolia Garden. Those who have boarded the early morning trains going to Zhushan Station will be delighted to see a cherry blossom tree at the sunrise viewing platform as well at Ogasawara mountain. To make your life easier, I have included the GPS location as well as the Google Map links to each of the popular sakura viewing spots that I have mentioned. These places are part of the standard blossom viewing trails and following the paths leading to them is already strolling along the sakura trail. There is a shuttle bus beside the Visitor Information Center and the vehicles take visitors to Shouzhen Temple (受鎮宮) and Zhaoping Station. The Alishan Magnolia Garden is beside the Shouzen Temple. People usually make a stroll leading to the Alishan Hotel where they will encounter the Alishan king cherry tree along the way. The king of all of the sakura trees in Alishan – king cherry tree. Its blossoming is one event people wait before deciding to visit Alishan during spring. How to get here: Board the Alishan shuttle bus going to Shouzhen Temple and follow the trail leading to the Alishan Ranger Station aka Forestry Bureau Workstation. A historic guest house that served as the home of nine governors that visited Taiwan during the island’s Japanese colonial period. There is a restaurant outside where tourists can enjoy drinking coffee while looking at petals of the Tokyo cherry. How to get here: The Alishan House is 92 meters from the Alishan Ranger Station. Visitors can board the Alishan shuttle bus going to Shouzhen Temple and then walk uphill along the road leading to the hotel. Drink a hot cup of coffee here at the Alishan House. A police station built in front of the railroad tracks of the Alishan Forest Railway. Here, visitors get delighted of standing near the base of the communication tower filled with Tokyo cherry blossoms. How to get here: Board the Alishan shuttle bus going to Zhaoping Station. Cross the railroad tracks to get to the other side and follow the trail leading to the Alishan Police Station. Your Alishan cherry blossom viewing experience would not be complete without a walk along the section of the Alishan Forest Railway stretching from Zhaoping Station to the Alishan Police Station. Visitors get crazy when they hear the whistle of the train, because they know it's the best time to capture the most memorable moments of their visit. a. From Alishan Station, board the train going to Zhaoping Station. Walk along the trail leading to Alishan Police Station and be ready for the arrival of the next train to get good photos. It was 11 °C at Zhaoping Station. When the train had already left, visitors can now cross again the railroad tracks. This is the main train station in Alishan. Visitors flock here during the early hours of the day to catch the first train going to Zhushan Station. How to get here: Board the Taiwan Tour Bus Alishan route (Bus 7329) from TRA Chiayi Station. Get off the bus at its terminal stop in Alishan. After paying your tickets and passing through the gate, walk towards the train station. If you're already inside Alishan, board the mini-bus that goes to the Visitor Information Center and then walk towards the train station. Rain had caused the petals of this sakura tree to fall on the ground. Sakura trees are planted along the sidewalk before exiting the wooden Alishan entrance gate. There is also a tall showa sakura tree on the slopes of the road facing the Alishan Catholic hostel. How to get here: After passing through the wooden Alishan entrance gate, walk to the other side of the road. There is a staircase along the sidewalk to get you closer to the showa sakura tree. This is a hotel 200 meters from Zhaoping Station. Beside it are young trees of Tokyo cherry blossoms. There is also a big tree with sakura-looking flowers. Locals say that they are cherry blossoms but of a different type. a. Board the train of the Alishan Forest railway towards Zhaoping Station. Walk towards the hotel. b. From the Alishan Visitor Information Center, board the shuttle bus going to Zhaoping Station. The bus stop is approximately 300 meters from the hotel. According to locals, these flowers are yinghua or cherry blossoms. They really look like the Tokyo cherry blossoms. Nice weather on a cold spring day in Alishan. Yeah! Not only the sakura flowers blossom in spring, the magnolias too! How to get here: Board the Alishan shuttle bus going to Shouzhen Temple. Find the staircase leading to the garden and walk approximately 190 meters to see the beautiful magnolias surrounded by sakura trees. There are two kinds of magnolias in this garden. and those with pink petals. There are many cherry blossom trees in the Magnolia Garden. These pink sakuras shower Alishan with its beautiful color. Q: Can I visit the cherry blossom viewing spots by riding the Alishan forest train? A: Yes, of course! But you will have to spend NTD 100 for a one-way ride from Alishan Station to Zhaoping Station. If you want to go to Shenmu Station and explore the area, then that will eat your time in searching for the cherry blossoms. You might need to stay in Alishan for at least one night to see everything that the entire forest recreation area has to offer. Check the timetable below for your reference. Q: I want to witness the world-famous Alishan sunrise. Is there a bus that will take me to Alishan to catch the early morning trains at Zhushan Station? A: If you are coming from Chiayi, then you will need to drive your own car. But if you are from Taipei, then you are very lucky. Bus 1835 leaves twice every night on Friday and Saturday from Taipei Bus Station and takes it visitors directly to Alishan. Prepare yourself for a 6-hour travel on this night bus. However, tickets might be scarce during the cherry blossom festival. To get your ticket, just go to the Guoguang counter at Taipei Bus Station and inquire if there is any seats for the dates falling on Friday and Saturday. Those staying at the hotels inside the Alishan Forest Recreation Area will have the chance to board the trains going to Zhushan Station Expected sunrise time ranges at Zhushan Sunrise Viewing Platform across all seasons. The exact sunrise time for the following morning is posted at the bulletin board at Alishan in the afternoon, a day before. The exact sunrise time during the day are also posted in large signboards at Zhushan Station. Departure schedules of the trains at Alishan Station are scheduled according to the time of the sunrise. Wulai Scenic Area is one of those places you should not miss when visiting Taiwan in late-January to the first few days of February. During this time, the cherry blossoms in front of the Wulai Waterfall will be blooming. Aside from the sakura, there are many exciting things to do like riding the Wulai cable car, the Wulai log cart, and eating some good food at Wulai Old Street. But I think the most memorable thing that happened to me during my cherry blossom trip in Wulai is when I stumbled and got wet at Nanshi River. The supposed photo in the hot spring river became a big splash when I lost my balance while walking on the river's slippery rocks. It was a funny and unforgettable experience. Haha! I have three Travel Buddies for this travelogue and they were Fisoliya (Zimbabwean), Sanjoy (Indian) and Yew Seng (Malaysian). From MRT Xindian Station, we boarded Bus 849 which took us to Wulai District of New Taipei City. Expect the bus to arrive at Xindian Station to be full of people during the Wulai Cherry Blossom Festival. Visitors have the option to board the bus at Taipei Main Station, but it will make your travel time longer. For the convenience of everyone, I strongly recommend tripool taxi. Travelling by Bus 849 is like riding an amusement park ride. The roads leading to Wulai are mostly zigzag so expect your body to swing left and right as the vehicle runs on the highway. Been there, done that! Price comparisons of one-way fares in tripool taxi going to Wulai Old Street. Up to a maximum of 8 passengers can be book in one ride. My Travel Buddies and I started our adventure in Wulai by eating on an Atayal restaurant. We walked from the Wulai Bus Terminal, until we found our way in Wulai Old Street and we ate in an Atayal restaurant for our lunch. I chose the bamboo rice with mushroom and it was very tasty. The rice was cooked in a bamboo. It was very soft and can be opened easily. I know that this method of cooking is also being done by aboriginal groups in the Philippines. Travel Buddy Sanjoy found a hot spring! My photo after I stumbled and dived into the waters of Nanshi River. After our lunch, we went down to Nanshi River where I have my wet and wild experience. Aside from the cold water, one can also find spots where hot steam is coming out. Build your own hot spring as what most people say here. Just use rocks to isolate the hot spring water to create a mini-pool and dip your feet or even your whole body. One woman came prepared and has a bathing suit . She dipped her entire body into her 'own' pool with only her head peeking out of the hot spring water. We also experienced riding the Wulai Log Cart. The Japanese developed Wulai before and they transfer the logs that they got form the forest using this minitrain. Today, it is now used to transport people to the 80 meter high Wulai waterfall from the Wulai Old Street. The one-way ticket ride costs NTD 50. It was a fun ride and I felt I was like in an amusement park. From the terminal station of the Wulai log cart, my friends and I walked towards to the area with cherry blossoms. The blossoming of the Taiwan cherry blossoms added beauty to the Wulai waterfall. I never knew that Taiwan's native cherry can be as beautiful as the Japanese varieties. I took a lot of pictures. Before we left the park, my Travel Buddies and I have a nice photo with the cherry blossoms and the waterfall behind. Nanshi river as the Wulai cable car goes upward. The Wulai waterfall can also be seen while riding the cable car. At the terminal station of the cable car was resort and we explored it. A machine that would tell you something about your future. Another attraction in Wulai was the cable car ride and it was the highlight of this travel adventure. Adult tickets cost NTD 220 while students need to only pay NTD 150. We were able to see the waterfall from above and it was magnificent view looking down from the flying bus. My ears were popping as the cable car ascends to the terminal station. On top of the waterfall was a resort and we explored the place. We took note of the last cable car. It was already dark when we left the resort but the waterfall was still visible. An aboriginal song played in the background as the cable car approaches the station. At night, sakura chasers are greeted by the changing colors of lights on the cherry blossom trees. Cherry blossoms, hot springs, cable car, log cart, 80 meter high waterfall. With so many things to experience, Wulai is really a wonderland. It is just right to say “Wow Wulai”. At the forefront of Taiwan’s cherry blossom festival in January is a road planted with cherry blossom trees. Abundant with Fuji sakuras that have grown inside the premises of big houses, springtime is will never be complete without seeing this place in Taipei. Pingjing St. Lane 42. Yes! You read it right! Taipei’s most celebrated corner in Shilin District is one of the best places to see cherry blossoms in the capital. Those wishing not to waste any minute of their precious minute in Taipei, must take advantage of the service of tripool taxi. Price comparisons of one-way fares in tripool taxi going to Pingjing St. Lane 42. Up to a maximum of 8 passengers can be book in one ride. The Taiwan gods must have listened to the prayers of the locals to bring back the beauty of the Fuji sakuras. The flowering in the last two years had not been good due to the El Niño phenomenon. 2016 was the worst as most buds suffered from frost. When snow fell in Taipei two years ago, the flowers that should appear in late January did not blossom anymore because they got injured by frostbite. Recovery took time and the flowering rates were starting to go back to normal again. There were many flowers and the bees were busy again pollinating each blossom. Local and international tourists gather at the street and compete for the best spot to take their photos. I was one of them and I must admit that it was really difficult to take pictures especially when it seems that all the people in Taipei came out on a sunny day. The weather turns wet and cloudy during spring in Northern Taiwan. So whenever there is a chance that the sun would show up, people go outside to take advantage of the nice weather. They come in huge numbers and turn Lane 42 into one great street party. The alley leading to Gongping Bridge, street wall, and the fenced area were the best spots to see the cherry blossoms, but unknown to many there is another place in Pingjing St. to enjoy the flowers. It’s a secret garden and the right time has come for it to be finally revealed. Walking to the end of the Lane 42, I heard the sound of laughter from a group of people. I can seen the great the joy in their hearts as they make a pose with the flowers. I can sense their happiness as I managed to find an opening and get inside the garden. There were tall sakura trees and it was the first time that I saw them. It was like Wuling Farm was brought to Taipei by an unseen force. A small piece of land catering to a lush forest of cherry blossoms. Who would not want to have that? It remains to be a mystery on who owns the garden and why people were allowed to roam around. Probably, it was one of the homeowners in Lane 42. Next year, I might be able to know the answer when I return to Pingjing St. for another round of the Sakura Series. Tamsui's most popular cherry blossom viewing spot is a must-see every March. Imagine seeing a round-shaped temple with sakura trees around its circumference. The petals of the pink flowers are blown away by the wind, showering everyone with infinite happiness. Tourists who come are always become victors in their sakura hunting. Most of the sakura trees are planted on what I called the “backyard”, where you can see the back portion of Tianyuan Temple. Although, it's very enticing to get near to the trees. People are restricted to enter the area by a yellow ribbon or a string. Tourists often find themselves climbing the stairs near the hill where they can have photos with tri-color sakura trees. For the past two years, the sakuras here opened their buds every February. Sometimes, they blossom in January. Usually, when this happens people become very excited and go directly to Tianyuan Temple to see for themselves the first pink petals. Knowing that the flowers will only last seven to ten days before they start to fall on the ground, tourists should not waste any time just to see their beauty. To get to Tianyuan Temple, I boarded the Taipei MRT via the Red line and alighted at Tamsui Station. I then transferred to Bus 875 which took its passengers to Tianyuan Temple. I knew that I was in my destination when most of the locals get off the bus. They were also in search of Taiwan's precious cherry blossoms! You must know that there are two kinds of cherry blossom here in Tianyuan Temple: the tri-color sakura and yoshino sakura. The two flowers have different blooming times which gives rise to two different cherry blossom viewing seasons. Tri-color sakuras appear first and it can be as early at mid-January as the first buds open to greet the visitors. Its beauty is expected to last until mid-February. Locals go to backyard of Tianyuan Temple and it becomes filled with people during these times. Up to now, I’m confused about the difference of the Fuji sakura in Pingjing Street to the tri-color sakura of Tianyuan Palace. They looked almost the same but the name “tri-color” suggest a combination of three colors for the flowers. At first, I thought of it as the flowers having a mixture of three hues within its petals. After this visit, I realized that the name “tri-color” refers to the three possible colors of the flowers. There is a white one, a pink one and reddish-violet color for the blossoms. Pretty weird and amazing as well. Three in one! The diversity of the flowers of the tri-color sakura makes visiting Tianyuan Palace something to remember every spring. After all the petals of the tri-color cherry blossoms are already gone. Tianyuan Temple will come into silence. It's the calm before the storm, as people wait eagerly for the arrival of the yoshino sakura. These flowers appear during March, but sometimes the flowers appear in April when the weather turns hot and abnormal. Their white to pinkish appearance is the reason why Tianyuan Temple is a very famous tourist attraction in Taiwan during spring. Walk around the temple and look at the sky, you will see the oriental design of the building's roof with the pink petals of the yoshino smiling back at you. Get inside the temple and go to the upper floors. It will be like flying without wings as you climb higher. Pretend that you are one of the gods and goddesses of Taiwan as you look to the ground from the veranda. The visitors getting frenzy over the flowers become the earthlings that worship you. Try to reach out your hand to the cherry blossoms, and feel what it's like to have a hand of a powerful diety. Look at that sakura tree! Visitors walk around the temple and appreciate the cherry blossom trees. Although most of the trees were almost in full bloom, some still have buds that are yet to open. There were still sakura trees behind the temple. A woman takes a close-up shot of the yoshino sakura. A couple enjoys the sakura flowers. No words can describe the sakuras here in Tianyuan Palace. Visitors gather at the base of the temple. See you next year Tianyuan Palace. MRT Tamsui Station (Red Line) -> Transfer to Bus 866,875,876,877 or F103. The bus terminal is just outside the MRT Tamsui Station and waiting time for the vehicles is shown on a TV screen. -> Get off the bus at Tianyuan Temple (天元宮) stop. You will know that you are in the right place when you passengers inside suddenly become crazy. Haha! -> Walk towards the backside of the temple for the tricolor sakura or go around the circumference of the temple for the yoshino flowers. A lush forest colored in pink awaits you in the heart of Taiwan. It's a different kind of feeling as one rides a cable car and take a peek outside the windows of the flying machine. You don't even need to have a drone to see this scenery. Magical and at the same time marvelous, a rosy cherry blossom world exists every spring in the Formosan Aboriginal Culture Village (FACV). It's as if the gods and goddesses of Taiwan have blessed the theme park with good fortune in the form of the cherry blossoms. Our deities stepped down from the sky and opened their hands to shower an invisible powder of infinite happiness. When the particles fell on the ground, it became seeds that grew to become the gorgeous trees of the cherry blossoms that visitors in Nantou see today. No amount of money or fame can match the feeling once you see a lot of yaesakura trees blooming at the same time. You will definitely run with excitement and let yourself get lost in a forest where the trees bear no leaves but only the multi-petalled flowers of the yaesakura. Friends, families and couples take photos together to preserve the memory of their visit. An everlasting moment for a short period of stay on this theme park. The sound of laughter in every thrilling ride fills the heart of every tourist in FACV with joy. This makes the place a must-see attraction in the island of Taiwan. How to get here? The easiest way is to board the High Speed Rail to Taichung Station and transfer to the Taiwan Tour Bus Sun Moon Lake route. At Shuishe Visitor Center, you one can ride the ferry boat to Ita Thao pier and to walk for 15 minutes to get to the Sun Moon Lake Ropeway. At the so-called Youth Activity Center building, you can now ride the cable car to reach the theme park. Another way is the board the Round-the-lake bus at the Shuishe Visitor Center and get off the vehicle at the Ita Thao Station. A quick and easy way to get to FACV is via tripool taxi. If you are coming from the HSR Taichung Station or from Taichung Airport and want to see the yaesakuras as soon as possible, then this private car method is for you. Have a look at the estimated fares of tripool taxi at the table below. Price comparisons of one-way fares in tripool taxi going to Formosan Aboriginal Culture Village. Up to a maximum of 8 passengers can be book in one ride. Entrance ticket prices vary and depend on the day of the visit. On holidays, the price usually gets higher. I got mine for NTD 850 which includes the round trip fare for the Sun Moon Lake Ropeway. Tickets to the theme park can be bought directly at the cable car station with separate booths for those who just want to ride the Sun Moon Lake Ropeway and back to the lake, or to those visitors who want to get inside FACV after getting off from the gondolas. > The theme park is a big place and there are various ways to go around. Visitors can walk, ride a bus or even board the cable car called the Skyline. The last option will give you a bird's eye view of our sakura paradise. Aside from the cherry blossoms and thrilling amusement rides, there are also tribal performances which feature the culture of Taiwan's aboriginal people. So be there, once the amusement park opens its gate early in the morning. A unique sakura world is waiting for you at the Formosan Aboriginal Culture Village. Chiang Kai-shek Memorial Hall will always be a top cherry blossom viewing spot in Taipei. Not only that it is located in downtown, it also has a variety of sakuras that visitors can feast upon. There are the multi-petalled yaesakuras, the white to pinkish flowers of the shuzenji sakura, the early blooming mountain cherries and the much-awaited spectacle of the tairyo cherry blossoms. Which flower do you want to see and where can they be found in the park? Read carefully this article because I will tell you a lot about these cherry blossom viewing spot in the city. You can find these flowers around the building of the Chiang-kai Shek Memorial Hall. Actually, all the cherry blossoms are planted near to this monument. They are just strategically planted to provide of an array of colors during spring. The yaesakuras are in full bloom when you see the flowers clump together. With the colder climate during the past winter season, their blossoming has been anticipated by many to be more abundant than last year. Keeping up with the expectations, the yaesakuras did not disappoint its fans by showing its strongest flowering with its red to pink color of its petals. Their tall branches spread out in the sky like the hand of God reaching out from the heavens. Its blossoms shower the CKS Memorial in intense red color. In the past, it was not like these and I was very surprised to see the park in such scenery. You can find most of the yaesakuras on the right side of the CKS Memorial Hall. Coming from Exit 5 of the MRT Station, walk towards the white building until you see patches of red on the right side of the park. There are also yaesakuras on the left side of the giant building although a bit fewer than on the right side. Aside from the yaeskuras, there also mountain cherry trees that have been planted on the left side of the park. I did not such much flowers when I visited this area. The blossoming period might have already passed and I visited too late to see them in full bloom. There were still a few trees that have flowers but not enough to amaze the visitors. At the back of the CKS Memorial Hall are the trees of the tairyo sakura. Behind these cherry blossoms is a pathway still planted with the yaesakuras. Come and explore this area of the park. It feels like going to Formosan Aboriginal Culture Village in Nantou by looking from afar in the walkway. Located on the right side of the CKS Memorial Hall, these flowers appear at the same time when the yaesakuras are at its height of flowering. Colored white to pink, it was very easy to tell that they are different from the red multi-petalled flowers of the yaesakura. How do I describe the petals of the shuzenji sakura? They looked crumpled and looks wavy. The trees are tall suggesting that they been planted long before. The main trunk and branches are strong enough to withstand the strong wind of typhoons that have been barreling Taiwan every summer. Although they look sturdy, I hardly noticed the shuzenji sakuras last year. There flowering wasn't that enough to catch the attention of visitors in the park. Fortunately, the splendid petals of the shuzenji sakuras have finally returned1 They were sparkling under the bright sun during my visit. They also looked terrific with the white building of the CKS Memorial Hall as a backdrop. It was picturesque! Comparing the blossoming of the shuzenji sakuras here in CKS Hall to the kawazu cherry blossoms in Sunshine Sports Park, I find these flowers of Taipei to have an undeniable charisma. One of my favorite Japanese flowering cherry! At the time of my visit, they had only opened 10 to 20% of their buds and you can find them at the backside of the CKS Memorial Hall. There were only a few tourists lingering in this area since the blossoms are not yet that many. I considered that as a blessing because there is a less chance of having photo bombers in my pictures. The tairyo sakuras gives a different kind of aura in the park. Not only it attracts insects like the bees, even birds come to feast on the flowers. The flower’s nectar might be so sweet to give nourishment and energy. Visitors, on the other hand, just look at them during full bloom. Envy of what is happening. Haha! When many, the flowers of the tairyo cherry blossoms have a striking similarity to the yoshino sakura and it is hard to tell the difference. Both the center part of the flowers has a dark hue. If you want to see the yoshinos, then you can go to the Visitor Information Center of Yangming Park. But you don't need to go far away, because the tairyo sakuras of the CKS Memorial Hall can cheer you up. At full bloom, it will fulfill your desire to see lots of spring flowers. The yaeskura, shuzenji and tairyo sakura in the Chiang-kai Shek Memorial Hall. They are all waiting for you. Hurry before they are all gone! Taoyuan is not known to be a cherry blossom viewing spot. It's mostly a flat land with fertile rice fields. But visit the mountainous areas of Fuxing District and you will see the pink flowers of the cherry blossoms. I'm talking about the Lalashan Area. It's a 2.5 to 3 hour bus trip from Taoyuan Station. With not enough trips to take visitors to the mountains, I really find it challenging to see the flowers here. I still remember the first time I went to Lalashan in my search for the pink petals. While inside the local train going to Taoyuan from Taipei, I had a chance to talk to a Taiwanese woman. She find it weird to travel from Taoyuan if there are cherry blossoms to see Yangminshan. I showed her the Chinese name of the place that I'm going to and she gave me a thumbs up. She also knew the place, proving that there are really places in Taoyuan that can serve as an alternative to the Wuling Farm Cherry Blossom Festival. I know the migrant workers in Taoyuan area especially the Filipinos are too excited to go the mountains and be surrounded by lots of cherry blossom trees. So let me tell you first about the public transportation system in Lalashan during the cherry blossom festival which happens every March. During the time of my visit, a shuttle bus was provided during weekends to take tourists up and down the scenic spots in Lalashan. My intuition tells me, that the this happens every year. There are three places that I have visited where you can see cherry blossoms: Zhongbaling Sakura Road, Guangming Leisure Farm, and Loving Farm. The first two are accessible by the festival shuttle bus but for the last one, you will need to have your own transportation. Loving farm is 3.7 km from the nearest bus stop and it will take you 1.5 hours of walking/hiking in the mountain road just to see the place. For a hassle-free cherry blossom viewing experience, you can create your own itinerary by booking your own private car for a day in tripool taxi. The technique here is to visit Lalashan in a group of four people or more so you can share your tripool taxi fares with your friends or loved ones. Price comparisons of one-way fares in tripool taxi going to Loving Farm. Up to a maximum of 8 passengers can be book in one ride. For those who don't have the budget, you can ride the Bus 5031 [Google Map] and 5091 [Google Map] from Taoyuan Station and Zhongli Rear Station respectively. There is also Bus 5090 which starts at Taoyuan Bus Station [Google Map]. With these buses that runs early in the morning, you can visit the Zhongbaling Sakura Road and the Guangming Leisure Farm. But for Loving Farm, you have to get a taxi at Shangbaling (上巴陵) [Google Map]. If not, then prepare to hike the mountains to get to that place, which is the best among the three that I have mentioned. I recommend going there on weekdays. During weekends, the parking lot of Loving Farm easily gets filled and it takes a long time to find a suitable parking spot. Information about transportation options to the Lalashan cherry blossom viewing spots, their locations and ticket price, if any. Fuxing Road (near to Taoyuan Station). Bus 5301 leaves at 6:30 am. I went uphill via Zhongxin Road to reach Loving Farm. It is the road on the left side on this photo. How to get here: Most visitors come to this place with their own car. If you don’t have one then you can board Bus 5301 from Fuxing Road near to Taoyuan Station and alight at Shangbaling (上巴陵) stop. The first bus leaves the city at 6:30 am and the next bus will be at 12:30 pm. Travel time is 2 to 3 hours. Once you are in Shanbaling, hire a taxi or hike the mountain road leading to the farm to travel 3.7 kilometers. Since I’m a budget traveler, I opted to walk and after 1.5 hours I finally reached Loving Farm. Sigh! The first kilometer was a bit steep, but after that Zhongxin Road becomes almost flat as I go higher in the mountains. I enjoyed the view of Fuxing District during my hike while at the same time burning some calories. Traffic control was being implemented in the mountain road by the farm authorities as it was not designed to be a full two-lane passageway for vehicles. Some portions of Zhongxin Road even becomes one and a half to one lane only! Drivers must be very careful and sometimes must give way to cars running in the opposite direction. Visitors taking Bus 5301 must take note of its departure times from Shangbaling. The first bus leaves at 9:30 am and the last bus will be 3:30 pm. Ignore the locals that will tell you that there are no buses going back to Taoyuan. Bus 5301 can become late but I assure you that it will arrive at the Shangbaling bus stop. At last! I reached the farm after walking for 1.5 hours. If you went here with your car, you will have to park it first in the designated area before you can enjoy the cherry blossoms. From the entrance, the road to the left leads to the cherry blossoms. I followed this family to find my way. A representative will hand you a ticket before you enter the parking lot with sakura trees. Status of flowering during my visit: “Full bloom” was predicted on mid-March. The parking lot was the main area to see cherry blossoms and the sakura trees here were full of flowers. It is still possible to see flowers around the 20th of March and even after that, because there were still trees that have buds that haven’t open yet. Do you want to play the swing? It was a great day to see cherry blossoms. ... but the main area is the parking lot. Visitors can bring their own food and have picnic under the sakura trees. Some even assembled their tents. A group of women went to the farm and wore their Japanese traditional dress. The sakura trees here in Loving Farm has this characteristic sway. I really loved it when the cherry blossoms are in full bloom. Do you have any idea why the sakura trees here sway? I know the reason why and I won't tell. Haha! One of the things that you have to do here is to stand on the high chair/ladder and have your photos taken by your friend. Of course I did it but through the help of my tripod. See? It was great to sit on the high chair. There was also this tall cherry blossom tree that visitors don't notice so I went up the hill and have pictures with it. Yeah! See you next spring Loving Farm. How to get here: Board Bus 5090 (from Taoyuan Bus Station), Bus 5091 (from Zhongli Rear Station) or Bus 5301 (from Fuxing Road, near to Taoyuan Station) and alight at Zhongbaling (中巴陵) stop. Special cherry blossom tour buses run along the Baling Road during weekends with an extension of the service scheduled every mid-March. The free rides start at 8:00 am and ends at 5:00 pm with 30 minutes of interval between the next bus. The service is temporarily suspended between 12 noon to 1:00 pm to allow drivers to eat their lunch. If you happen to hop inside this mini-bus, show the driver the Chinese name of the Zhongbaling Cherry Blossom Road (中巴陵櫻木花道) to inform him of your destination. Special bus stop signs have been placed along Baling Road and the designated marker is a few meters away from the so-called Zhongbaling Sakura Flower Road. Status of flowering during my visit: More than 80% of the flowers have opened. However, the recent rains in Northern Taiwan had caused some of the petals to dropped on the ground shortening the time to enjoy the cherry blossoms on this place. I boarded Bus 5301 near to Taoyuan Station and alighted at Zhongbaling stop. The famous cherry blossom road is a walking distance from the bus stop. I got really excited upon seeing this cherry blossom forest for the first time. Some of the petals of the sakura here have dropped due to the recent rains in Northern Taiwan. I wanted to see how long is this cherry blossom road so I continued the walk and passed by an abandoned car. They were not so many here so I decided to go back to the main sakura "forest". Petals that had dropped on the floor. It feels so peaceful here. Now I'm back to the main forest. There is some sort of a hotel here beside the cherry blossom road here in Zhongbaling. I even saw people came out of the building. I arrived in this place at 8:30 am and as time goes by more people had arrived to take photos. Imagine opening your window after you wake up in the morning and you see cherry blossoms. I wonder who owns the building on the left. This cherry blossom road really looks nice. Nice photo except for that photobomber. Haha! I didn't try to order a cup of coffee and enjoy the view of the cherry blossoms but next time I might do it. More people had arrived and they came in groups. Suddenly, the clouds disappeared and the blue sky complemented the pink color of the sakuras. The Zhongbaling Cherry Blossom Road should not be missed if you come to Taiwan to see sakura flowers. However, it is a 2 to 3 hours travel time from Taoyuan Station. But if you come at the right time you will be enjoying walking under the pink petals of a cherry blossom forest. How to get here: Board Bus 5301 from Fuxing Road near to Taoyuan Station and alight at Yong Long Farm (永隆農場) stop. Walk uphill in Baling Road for 270 meters to reach the cabins with cherry blossom trees. Special cherry blossom tour buses also run along the Baling Road during the cherry blossom season every weekends. You ask the people at the Lalashan Visitor Information Center about the shuttle service. Although they can't speak Chinese, they might try to answer your questions. The free rides start at 8 am and ends at 5 pm with a 30 minutes of interval between the next bus. The service is temporarily suspended between 12 noon to 1:00 pm to allow drivers to eat their lunch. If you happen to hop inside this mini-bus, show the driver the Chinese name of Guangming Leisure Farm (光明農場) to inform him of your destination. Status of flowering: Most of the sakura trees here had already achieved full bloom. It was not a big place but it was picturesque. One thing that makes this place beautiful are the fog cherry blossoms. The petals of the fog cherry blossoms are color white hence the name of the flower. These are the typical cherry blossoms that I always see in Taiwan. Pink vs White. Which do you choose? The sakuras in Guangming Leisure Farm really looks awesome. Can you see me? Haha! Aside from the pink sakuras, there were also Japanese white sakuras that were blooming. If my memory serves me right, these are yoshino flowers. A bee sipping nectar from the yoshino sakura. Guangming Leisure Farm is a charming place to see cherry blossoms. Fly above the cherry blossoms, watch the cable cars as they soar in the sky. Visitors in Sun Moon Lake (SML) can't stop themselves from taking pictures of the so-called Ropeway with the sakuras flowers as the background. SML's own version of Maokong Gondola always surprise visitors when they get to see the town of Ita Thao. Not only they can enjoy delicious traditional food, they also get a chance to see lots of pink flowers and and a fantastic scenery that they won't find in any place in Taiwan. The cherry blossoms at the cable car station of Sun Moon Lake appear every early-March. During this time, the yaesakuras at the Formosan Aboriginal Culture Village will be at its end. The pink sakuras will be the star of the show during this period, putting the spotlight at Ita Tha Station of Sun Moon Lake. Tourists don't need to board the gondolas nor buy tickets to enjoy the cherry blossoms. Just enter the car park of the cable car station and start your picture taking. Climb the viewing deck and gaze your eyes at the sky. Blue, yellow and red. The flying machines leading to other side of the mountains are tempting you to have a wonderful ride. 2. THSR Taichung Station → go to Exit 5 to wait for the bus or buy the Sun Moon Lake Pass -> board Taiwan Tour Bus Sun Moon Lake Route → get off the bus at Shuishe Pier stop → transfer to Sun Moon Lake Round-the-Lake shuttle bus → get off the vehicle at Sun Moon Lake Ropeway Station (Youth Activity Center) (日月潭纜車站(青年活動中心) [Google Map]. 3. From Shuishe Pier: board ferry to Itao Thao Pier → walk to Sun Moon Lake Ropeway. 4. By tripool taxi: Start from HSR Taichung Station and travel directly to the Sun Moon Lake Ropeway Station. Price comparisons of one-way fares in tripool taxi going to Sun Moon Lake Ropeway Station (Youth Activity Center). Up to a maximum of 8 passengers can be book in one ride. Taipei is the first choice of sakura chasers in Taiwan. The capital has lots of spots to offer with Yangmingshan, Pingjing St. Lane 42 and Broadwood Park as the go-to places during spring. On the question about on when is the right time to see them, the information can be found at the 2019 TAIWAN CHERRY BLOSSOM FORECAST portion of this travel guide. The Taipei section on the dynamic prediction table is on the topmost portion. Control your excitement as you continue reading below, because Taipei have cherry blossom viewing spots beyond Yangmingshan that are worth to see. Every year the blossoming of the flowers at Xinyi District on the intersection of Songzhi and Songgao Road excites people. Located near to the MRT Taipei City Hall Station is a group of sakura trees, they were standing there without leaves until news will spread like wildfire. Whether the flowers are many or just a few blossoms became my task, so I went immediately to check them. A tall tree can be seen with its flowers wide open with a few buds that are just waiting for the right time. Not far from where the trees are planted is Taipei 101, Taiwan’s top attraction in the city. For the past two years, it was always cloudy here in Xinyi District when the flowers are in full bloom. But with the sunny sky above Xinyi, it was a perfect day for cherry blossom viewing. It was very rare to see the flowers in their pink color while being illuminated by the light of the sun. I was expecting to see the flowers in February. Last year, they blossomed late. This was probably due to the delayed arrival of the northeast monsoon. In order for the flowers to open, the cherry blossoms need a cold weather aside from other factors like soil pH, wind direction, and sunlight. Without the right conditions, the flowers would stay as buds until the right time comes. Expect the flowers here to appear starting every 20th of January, with the best time being Feb. 10 or 15 as more flowers greet the blue spring sky. Usually, when they appear in January, it means that the current winter season is cold enough to be classified as a normal weather phenomena. It also indicte that the other sakura trees in the city and in the mountains of Yangmingshan will have a bountiful blossoming of its flowers. I always monitor the situation of the cherry blossoms in Xinyi District, until they approach their peak period. The place is just a 10-minute MRT ride from my home. The trees here plus the ones beside Taipei City Hall are worth to see. Once they come out at the same time, they will be a visual treat for everyone to enjoy. How to get here: Board the Taipei MRT to Taipei City Hall Station. Go to Exit 2 via the escalators and get out of the Taipei City Hall Bus Station into the direction of Taipei 101. The cherry blossoms are located at the intersection of Songgao Road and Songzhi Road. Standing in front of cherry blossom trees, a couple kisses each other in a garden in Taipei’s Shilin District. Such sight is so common during springtime. When sakuras appear in the city, lovers dressed in formal attire wander in Taiwan’s scenic spots. They were there to take their prenuptial photos. And what place do they usually go to? It’s the Taipei Flower Test Center. From cherry blossoms to plum blossoms, there are many flowers here that every month there is always something to look forward to. For January, the Taiwan cherry blossoms are expected to appear in the park. Thanks to the cold weather in Taipei, the sakura trees are now back to its normal flowering rate. Riding a bus going to Yangmingshan, visitors can’t resist looking at the park as the vehicle passes by. Tall branches trying to reach for the sky. Its red-violet flowers waving hello to all the passersby. Admission is free and everyone is invited to have a leisurely walk in the park. For those expecting the pink color of the cherry blossoms. Don’t worry! The Taipei Flower Test Center have some showa sakura. However, they will appear at a later time. The park also has multi-petal cherry blossoms called the yaesakura. Like the showa, these sakuras have a later blossoming period compared to the Taiwan cherry blossoms. Expect these flowers to appear in February and March if the weather conditions are favorable for the buds to open. Sakura fans in Taipei were delighted to know that tulips were on display in the park. Yellow, violet, red and some were a mixture of warm colors. They were fun to look at making you feel that you went to The Netherlands without ever leaving Taiwan. If the tulips were not enough, then there are the beautiful flowers of the camellia. The camellia festival takes visitors to a dazzling floral world. Go inside the exhibit area and get amazed at its different sizes and shapes. At the garden, plants filled with the camellias are for everyone to enjoy. They look like giant roses but much larger in size. This has been my best visit in the Taipei Flower Test Center. Taiwan cherry blossoms at 80% flowering rate + tulips + camellia festival. I went home as a winner for this episode of the Sakura Series. (山仔后派出所) [Google Map]. The park is on the other side of the road. In downtown Taipei, Broadwood Park in Neihu District is a hotspot to see the pink cherry bossom flowers. Every year, the first flowers appear around late-January to the first week of February and I went here again in Neihu to see their beauty for the third time. Going here on a weekday was a nice decision. There were fewer people as most residents in the city are still working in their offices while the kids are also attending their classes in their respective schools. But go here during the Chinese New Year or the weekends and the whole park will be like a night market with a very large crowd! Seeing the cherry blossoms is still possible at night because lamps had been set up on the ground to illuminate the flowers. I haven’t tried visiting here after 6:00 pm though I bet that the scenery would also be great. The flowers will become the stars of the evening bringing you a different kind of a starry night experience. Just check the forecast of the Central Weather Bureau for Neihu District [CWB Neihu District forecast] before hurrying to go here. The rain could ruin your visit and make the grass area muddy. The cold wind with some snow brought by the northeast monsoon made the weather much colder weather in Taipei. This stimulated the earlier than expected opening of the mountain cherry. Just when Pingjing St. Lane 42 was at its height of being a sakura viewing hotspot in late January and early February, the flowers in Broadwood Park will silently open its buds. Early bloomers are usually exposed in the elements for a longer time forcing the petals of the sakura to lose their freshness against the non-stop rainfall in Northern Taiwan. At the time of this writing, most of the flowers were no longer attractive much to the disappointment of the sakura fans. Anyway, that’s life! There are still a lot of cherry blossoms to see every springtime in Taiwan so there is no reason to cry if your visit turned unfortunate. Just smile and be happy for the rest of the Sakura Series. How to get here: Board the Taipei MRT and alight at the Sun Yat-sen Memorial Station. Go to Exit 4. You can find the cherry blossoms behind the pond. The kawazu sakura trees here are not that tall. They are just enough to let visitors in Taipei see some cherry blossoms. This is a secret spot in Taipei that is not known to many travellers. This is the only place I know where you can have a panoramic view of the Taipei City plus the flowers of the cherry blossom. Expect the sakuras here to appear on late-March to the first few days of April. This is one of your last resort if you are chasing cherry blossoms at the tail-end of the flower season. 1. Board the MRT Taipei Red Line. Get off at Beitou Station and ride Bus S9, S26 or 129 and get off at the Dormitory of Quanyuan Elementary School (泉源國小宿舍) stop. Visitors can also ride Bus S8 which starts at MRT Shipai Station (Red Line). Walk 750 meters to get to the Shibafen Waterway. 2. by tripool taxi. Users must type the Chinese name of the place in the web app. Price comparisons of one-way fares in tripool taxi going to Shibafen. Up to a maximum of 8 passengers can be book in one ride. Like Shibafen, Dongfang Temple's cherry blossoms are part of the late-bloomers group. Visitors cannot go inside the temple, but this place has a unique scenery which you can enjoy as you stand from its gate. The only problem in going to this sakura spot is the frequency of Bus S16. So you have to schedule your visit here according to the departure times of the bus. Or else, you will spend some of your time standing and waiting at the bus stop. How to get here: Board the Taipei MRT and alight at Jiantan Station (Red Line). Transfer to Bus S16 and get off the bus at Dongfang Temple (東方寺). Price comparisons of one-way fares in tripool taxi going to Dongfang Temple from selected MRT stations in Taipei. Up to a maximum of 8 passengers can be book in one ride. Status of flowering during my visit: Full bloom. The sakura trees on the left side of the garden had already spent its flowers. How to get here: Board the Taipei MRT and alight at Donghu Station. Go to Exit 3 and walk along Donghu Road to reach the far end of Broadwood Park. Enjoy the young shōwa sakura trees here planted beside the creek. Status of flowering during my visit: 20% to 30 % of the flower buds have opened. The flowers were not yet in full bloom at the time of my visit. The cherry blossoms are of the Showa type. This creek trail in Neihu is actually a continuation of the Broadwood Park. The showa sakuras bloom late than the usual cherry blossoms in Taiwan. This creek trail will be great once the sakuras are in full bloom. I want to live in this community during spring. Haha! You can go on the other side of the creek and you will find more young sakura trees planted along the banks. A stairway to heaven. Do you want to climb this staircase that leads to a feeling of unexplainable happiness? Experience taking each step as your eyes gaze at the beautiful flowers of the cherry blossoms hanging above you. You can find these steps in the mountains of Taipei. The place is called Bishanyan and just a few minutes away from an MRT Station. It seems that it's not just the province Nantou that have received the blessing of the Taiwan gods. Empty hearts are filled with joy as one takes a look at the view of the city while picking ripe strawberries in the farms. Locals come here to pray at the temple and savor the fresh air from the mountains. Taipei’s Neihu is definitely one place not be missed during the spring season especially when the sakuras starts to appear every late-February to the first few days of March. Every visitor is mesmerized by the petals of the cherry blossoms and even I was a victim of their unparalleled beauty. From the moment I get off from the bus to the highest point of that staircase, I can't remove my eyes from them. I was totally starstruck! Surprisingly, there were many visitors on a busy a weekday. If they have decided to take a leave from their work, then it must have been a good decision. The flowers were still many although the weather was cloudy. But it didn't stop visitors from going to Neihu to see the sakuras. Every click of the camera, pose after every pose. The smiles on their faces are endless as each person's laughter was music to everyone’s ears. Not only humans visited the place. There were also insects. The bees were present as well as the butterflies. The Taiwan gods must have transformed themselves into these winged beings to check the fruit of their labor. They want to know if the invisible powder of infinite happiness they have spread in Central Taiwan have reached Taipei. It did and every visitor was so happy. How to get to Bishanyan? Just board the MRT and get off at Neihu Station (Brown Line). Look for the Jiantou Fude Temple (梘頭福德祠) [Google Map] located at Neihu Road Section 2 and wait for Bus S2. The vehicle will take you up in the hills where the strawberry farms can be found. Get off at the famous stairs of Bishanyan or the Yuanjue Temple (圓覺寺) [Google Map] and you can now start taking pictures and selfies with the cherry blossoms. A private restaurant where you can take pictures with the sakura. Admission is not free and tickets cost NTD 100 per person. There is also crowd control and on how many people can enter the restaurant's premises at a particular time depends on the person manning the gate. You must take note of the this, especially if you are planning to visit in the afternoon. It's better to go in the morning when there are less people. Board the Taipei MRT and alight at Jiantan Station (Red Line). Transfer to Bus S19 and get off at Falun Temple (法輪禪寺) stop [Google Map]. Orange Café [Google Map] is only a one minute walk from the bus stop. Visitors can also board Bus 303 and alight at Pingdeng Village (平等里) stop [Google Map] but it will be a 900 meter walk uphill to reach the restaurant. 2. by tripool taxi: Users must type the Chinese name of the place in the web app. Status of flowering during my visit: 80-90% of the flowers are in bloom. Price comparisons of one-way fares in tripool taxi going to Orange Cafe restaurant from selected MRT stations in Taipei. Up to a maximum of 8 passengers can be book in one ride. Crowd control is being implemented in the restaurant. Visitors have to wait before they can enter the place. I waited for at least 30 minutes. Visitors who have just entered the gate. The flowering of the yoshino cherry blossoms was really god during my visit. The sakuras were not yet in full bloom but the weather was perfect for a cherry blossom viewing experience. This pathway leads to the restaurant. How to get here: The same directions going to Orange Café. Board either Bus 303 or S19 from MRT Jiantan Station. Visitors must then walk 130 meters from the restaurant to reach the trail, where on the slopes of the mountains you can see a sakura forest. The cherry blossom trees are inside a private lot but you can still appreciate the flowers from afar. The private residence with the sakura forest. This place was almost a mystery to me on who was the owner and how to get inside. The Neicou Stream acts as a natural barrier for those attempting to climb over the fence. Cherry blossom fans will be delighted to know that New Taipei City has lots of sakura viewing spots, with Tianyuan Temple in Tamsui District and Wulai being the most popular. The city surrounds the capital of Taiwan which includes the famous towns of Pingxi, Yehliu and Jiufen. Being a mountainous area, it is easy for cherry blossom trees to grow here. And like in downtown Taipei, some spots are accessible by the Taipei MRT or TRA. A ray of sunshine. A breath of fresh air. A new place has been discovered to see the kawazu cherry blossoms. Sunshine Sports Park! New Taipei's public park welcomes you to make a stroll during the sakura season. Adding more excitement to my visit in Xindian District is the fact that I haven't been to Xiaobitan where the park is located. The place is accessible via the MRT Xiaobitan Station and visitors have to walk for two kilometers. A bit tiring for those not used to walking “long” distances. The MRT Xiaobitan Station functions as a depot of the trains of the Taipei MRT system. Being a branch line, it is somewhat similar to the Xinbeitou Station. Although, I noticed a big difference. The MRT trains going to Xiaobitan Station run faster compared to the inch by inch movement of the Xinbeitou trains. Haha! I don't know the reason why. Stepping out of the MRT station is the wide floodplain of the Xindian River. This body of water connects to the Tamsui River which then flows out into the East China Sea. If you look at the Google Maps, this river seems to be an old one. It has a winding path which tells a lot about its history in geological scales. Sunshine Sports Park and the MRT Xiaobitan Station is separated by the rivers, so visitors will have to cross a bridge. Their eyes will most likely get mesmerized by the Sunshine Bridge (陽光橋). Depending on how the viewer perceives the metallic structure, it can look like a fish, a bird or even a crayfish. Just use your imagination. It should not be missed when visiting Xiaobitan. The kawazu cherry blossoms can be found along the trail on the park. I have marked them in my Taiwan Cherry Blossoms Map to make searching for them easier. The trees don't blossom at the same time so you would most likely see flowers with some leaves, while others still have unopened buds. Enjoy the flowers while they last. Showa sakuras lined up the riverside near the MRT Haishan Station (Blue Line). The flowers here usually appear during late March or early April. But when the weather turns hot and abnormal in Taiwan during winter, it can be as late as mid-April. Together with Taipei's Dongfang Temple, Shibafen and the Sansei Trail in Sanzhi District, these places form the quartet that sakura chasers should look upon when Taiwan's cherry blossom season is about to end. How to get here: Board the Taipei MRT and alight at Haishan Station (Blue Line). 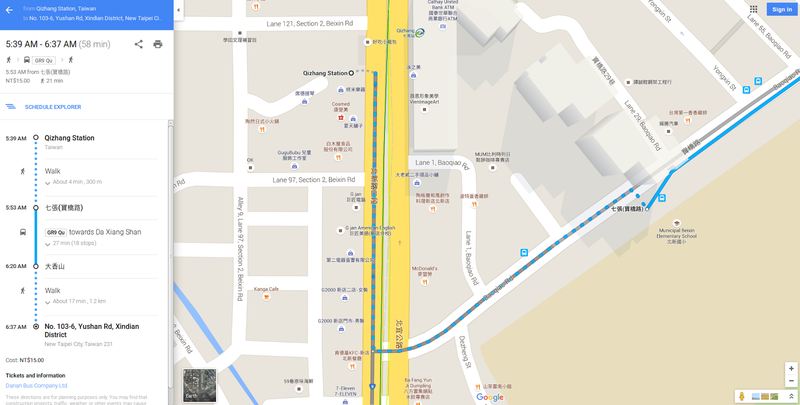 Go to Exit 3 and walk towards the Hope River Plaza (希望之河廣場) [Google Map]. You will see a creek with sakura trees that blossom every late March or early April. Status of flowering during my visit: >90% of the flowers have opened. The Royal Dragon Sakura Forest is a private farm in the mountains of Xindian District. It is one of those places that I have visited when the luomujie blog's Sakura Series was just starting three years ago. I used to call this place Tenglong Sakura Farm due to the lack of official English name in Google Maps. A Taiwanese have told me a long time ago, that translating the Chinese name of Tenglong Sakura Farm to English will not make sense. Anyway, there is already an English name and it's now known as the Royal Dragon Sakura Forest. Haha! Just go on the right time and you will be lucky to see lots of flowers. This is an underrated to place to see the sakuras and only locals knew about this place. I find it hard to visit here for the first time in 2016. Expected blossoming periods happen between early-March to mid-March. In the past, some of the flowers have bloomed late in April with no actual peak period to remember. After three years, the luomujie blog will be visiting again the Royal Dragon Sakura Forest this 2019. Let's see if it's ready again to show its charm to everybody. Price comparisons of one-way fares in tripool taxi going to Royal Dragon Sakura Forest. Up to a maximum of 8 passengers can be book in one ride. Board MRT and get off at Qizhang Station (Green Line). Go to Exit 1 and turn left to cross the Baoqiao Rd. 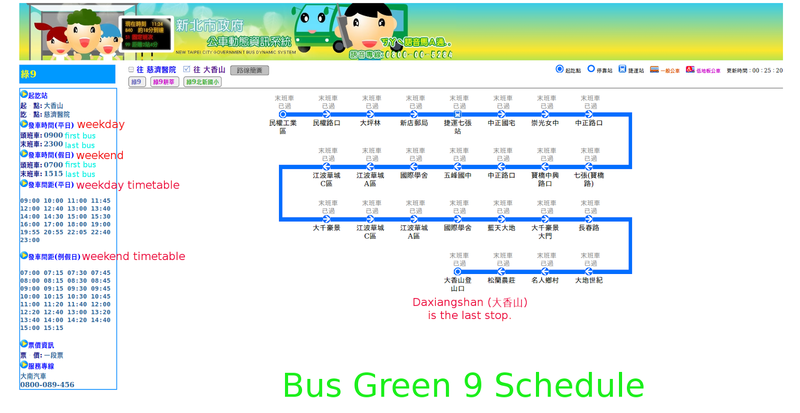 Look for the Bus GR9 or Green 9 bus stop which is located in front of the Beixin Elementary School (北新國小) [Google Map]. The said school is the best place to wait for Bus GR9. If you are going to wait on the other bus stops, there is a high probability that the driver of the mini-bus won't notice you as drives along the highway. There is also an LED screen at the bus stop in Beixini Elementary School so you will know when will the vehicle arrive. It is also close to a McDonalds. Haha! Anyway, after patiently waiting a shuttle bus would soon arrive with the Chinese character for Green and the number 9 on its LED display. Alight at Daxiangshan (大香山) which is the last stop and hike the Daxiangshan Trail until you find the entrance to the Mt. Dailaokeng Trail. Continue the hike in this trail to Yushan Rd. until you find a restaurant on top of the mountains with a beautiful view of Taipei City. The cherry blossoms are down below in the gentle slope of the hills. Admission is free and it is open to the public. The total distance from the sakura farm to the bus stop is about 1.2 kilometers. Yaesakuras in the parking lot of a government office in Taiwan. The numerous petals of the reddish cherry blossoms definitely makes a noise in this quiet town of Shulin every early-March. Just a short walk from TRA Shuilin Station, you will find yourself somewhat looking to old Taipei. Wandering on the streets to find the flowers, you will feel a nostalgic vibe about the town. When you reached the Shulin Land Office, remember that it's not a tourist spot and you will be entering the premises of a government office. The yaesakuras were planted near the fence and they were put there as ornamental plants. Nevertheless, it's a nice place to visit on a weekday with less people around to become photobombers on your pictures. How to get here: Board any train of the TRA and alight at Shulin Station. 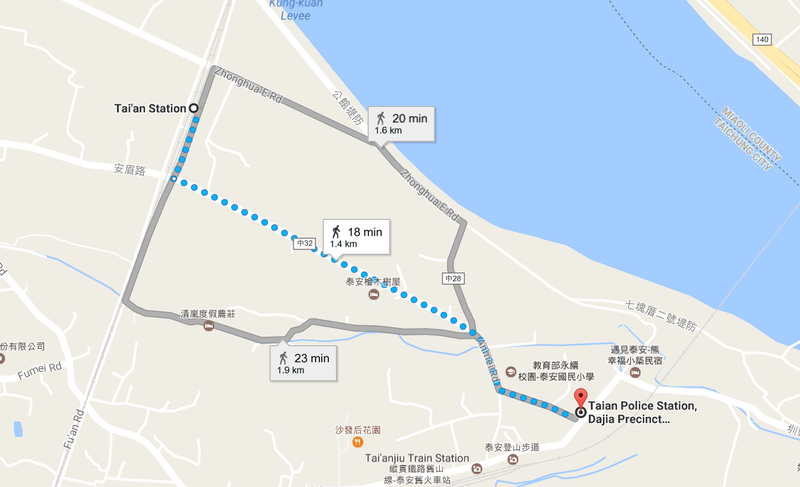 Get out of the station via the Zhongshan Road Exit and walk for 150 meters to reach the New Taipei City Shulin Land Office [Google Map]. The yaesakuras there were planted at the parking lot. I get out of the train station via the Zhongshan Road Exit. I was lucky to see the yaesakuras in full bloom. Going here on a weekend will be crazy. During the sakura season, get yourself ready to mingle with a large crowd with the long line of cars on the mountain road. But seeing lots of locals here means that Xiong Kong Cherry Blossom Forest is worth to see. A mountain slope full of pink petals. It's like looking at a painting with your own eyes. I bet that you will be dying to see this place. But don't expect a leisurely stroll because you will have to do a little hiking. No bus passes by near the sakura forest and locals come here with their own car. So during my first visit, I have to be creative in going to Xiong Kong and back to downtown. Being a budget traveller, I don't want to spend so much on taxi fares. To save money, I borrowed a folding bike from a friend and took the bike inside the MRT on a weekend. 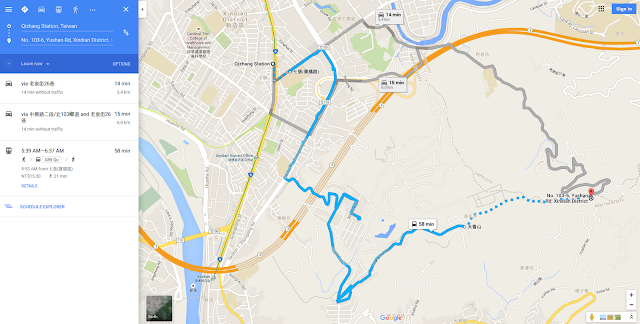 At Dingpu Station (Blue Line), I folded the bike and got a cab that took me to my destination. However, it was a hell of a traffic jam in the mountains. With just 3 kilometers away from the Xiong Kong Sakura Forest, the taxi driver decided to drop me off. Sigh! It's a pity that I have to cycle to reach the carpark and then walked more to get to the start of the trail. And after enjoying the cherry blossoms, I decided to go back to downtown by cycling back to MRT Dingpu Station. It was a tiring 15 kilometer bicycle adventure. Haha! This 2019, tripool taxi can now take visitors to Xiong Kong Sakura Forest. I highly recommend this service because you will be given the power to schedule your trip, especially if you are going on a group of three or more people. Start your travel from your hotel/hostel in Taipei and be at the the cherry blossom forest in no time. Just book a tour on a weekday so that you won't get stuck in a traffic jam. How to get here: The nearest MRT Station is Dingpu (Blue Line) and is the last station of the Bannan Line. Prospective visitors should come to this place on a weekday to avoid the traffic jam in Zhulun Road. a. board Bus F629 and alight at Zhu Lun Tea Plantation (竹崙茶場) stop. Walk for 5.1 kilometers to reach the sakura forest. 4. by bike: Visitors who are physically fit can cycle uphill for 15 kilometers. Bikes can be taken inside the Taipei MRT for a price of NTD 80. Weekends and holidays are the only allowed days to bring in bikes (both folding and non-folding) inside the trains of the Taipei Metro. On weekdays, folding bikes are allowed but it has to be placed inside a bag. Tourists who don't have bikes can rent the YouBikes parked near the exits of MRT Dingpu Station. Don't forget to bring your smartphone with mobile internet to track your way. D. by a yellow taxi and bike: Take a taxi with your folding bike and show to the driver the Chinese name of the place: 熊空櫻花林. On your return trip, test your biking skills as you cycle downhill back to the MRT Dingpu Station for 15 kilometers. E. By bus and bike. If you have a folding bike and if you are allowed to bring it inside the bus then it is possible to try this option. Bus F629 is usually a mini-bus and taking folded bikes inside is a bit impossible. Bus Blue 45 on the other hand can be a mini-bus or a low-floor bus. If it's a low-floor bus, then you can bring inside your folded bike. To avoid causing inconvenience to fellow passengers, cyclists should be placed their folded bikes inside a bag. A smartphone with mobile internet will be very useful along the way. Expect the flowers to appear between mid-Feb to mid-March. My visit was the last hurrah of the flowers before they totally disappear in the eyes of the cherry blossom fans. The ticket for taking a bike inside the Taipei MRT was NTD 80. It was a weekend and there were many visitors. To reach the cherry blossom forest, people have to climb the slopes of the mountain in Zhulun Road. A white variety of the cherry blossoms. These were probably yoshino sakura. The trail was not developed and it was muddy in some areas. Anyway, people ignored it just to see cherry the famous cherry blossom forest of Sanxia District. At long last, I have finally arrived at the Xiong Kong Cherry Blossom Forest! To see the whole of the forest, visitors have to continue walking along the trail built along the slope of the mountain. Can you see the people on this photo? Visitors enjoying themselves to take photos and selfies. It was just a bit difficult to travel here because of the lack of public transportation. I had been planning a long time ago to see this place and I was so happy to be here. From a real sakura forest, let's go to a mobile forest. Lung Yen cementery is a secret spot to see cherry blossoms in New Taipei. Yes! You read it right. It's a cementery. But don't be afraid to get here, because what you are going to see are not tombs but large sakura trees on large pots. Hence, the name mobile making the cherry blossoms here to be taken anywhere. When I first came here, the entire place was raining petals. The wind was blowing strong that the place is showering with cherry blossoms. Had it been that I visited early, then I would have a great set of photos. The cherrry blossoms here are of the Tairyo type and Yoshino type. Visitors can get to Lung Yen Mobile Sakura Forest via tripool taxi. With its close proximity to Tamsui's Tianyuan Temple, tourists can get to these places in just one day. Check the sample itinerary below to help yoin booking your trip in tripool taxi. How to get here: Board the Taipei MRT at alight at Tamsui Station. Go to Exit 2 and transfer to either Bus 860,861,862,863,864,865,866 or 867. Alight at Sanzhi Station (三芝站). Get a taxi and tell the driver to bring you to Lung Yen Life Group (龍巖真龍殿). Tell him also that you want to see yīnghuā aka cherry blossoms (櫻花). Do not forget to get the driver's calling card for your return trip. Status of flowering during my visit. Already past the full bloom and the petals are raining everywhere! A pink variety had been starting to appear and I expect this type of sakura to blossom in two weeks. The tower of Lung Yen Life Group. From what I know, it is some sort of cemetery. I was still lucky to find some trees with a lot of flowers. What a pity! The place could had been more beautiful if the trees did not shed their precious petals. It is a mobile forest due to the fact that the sakura trees can be moved from one place to another. Just look at their bases. The flowers here were of the Tairyō sakura (大漁櫻) type. They are more white compared to the Tairyō sakuras in Chiang-kai Shek Memorial Hall. Visitors usually bring their own cars to see this place. The tower of the Lung Yen Life Group was really intriguing. I should feature this building in my blog someday. The rays of the setting sun illuminated the whole place. The base of the sakura trees with fallen petals. Aside from the while cherry blossoms, there were also pink varities and probably at the end of March it will be in full bloom. The mobile forest of the pink varieties that are yet to blossom. A formber gambling site turned into a cherry blossom avenue. Who would thought such place can be a sakura site? Stretching for about 10 meters, the riverside near Tianyi Road becomes a hotspot to see a yaesakuras. Being planted beside the creek, the temperatures here were cooler than most in places in the city. The trees were first planted almost a decade ago and it took five years for the first flowers to appear. When I first visited this spot in Wugu District, I was awed to see the pink to red color of the yaesakuras. However, the riverside needs some cleaning. If you want to see a more touristy spot, then it's better to go to other places to see cherry blossoms. How to get here: Board the Taipei MRT and alight at Luzhou Station. Go to Exit 1 and transfer to Bus 704. Get off the bus at Cheng De Park (成德公園) and walk for 550 meters to reach the street planted with yaesakuras. The sakura trees are planted along the banks of a creek. The cherry blossoms here are of the yaesakura type. It was reported that this area in Wugu District was a former gambling site. The place is now safe to walk by and it became more beautiful with these cherry blossoms. How would you feel if you wake up in the morning and see the red petals of the yaesakuras? The yaesakuras have multiple petals and different from the usual Japanese flowering cherry varieties. Flowering was at 60-70% rate at the time of my visit. How to get here: Board any local train of the Taiwan Railway Administration (TRA) and alight at Xike Station. Go to Exit 1 and follow the elevated railroad tracks of the TRA going to Taipei. Turn left when you see a creek. Walk along its banks up to Xiding Road and enjoy every sakura tree that you will see there. Status of flowering during my visit: Some of the trees were already in full bloom. Other trees have opened half of its buds. There were also leafless cherry blossom trees with buds just waiting for the right conditions to blossom. The flowering this year wa a bit late but there were already trees that shows its beauty. People who live near the creek. I really like when cherry blossoms form clusters. Just look around and you will see lots of sakura trees. There was a temple nearby. Taiwan's cherry blossom won't be complete without a visit to Wulai New Garden's City. Coupled with a trip to Wulai Old Street, visitors enjoy taking pictures with trees full of sakuras. The flowers appear every last week of January to the first week of February. You can just hop on Bus 849 from MRT Xindian Station to reach this place. The same bus also starts from Taipei Main Station. But Expect a very tiring ride if you decide to start your journey from there. It would also make a stop at MRT Xindian Station and this vehicle is usually packed with people, wishing to dip their bodies in the hot springs of Wulai. Anticipate more visitors during the cherry blossom season. To avoid the hassle of waiting too long for Bus 849 and standing for one hour, because there are no more seats left, book your trip with tripool taxi. Price comparisons of one-way fares in tripool taxi going to Shenzhang Bridge bus stop (New Garden City cherry blossoms). Up to a maximum of 8 passengers can be book in one ride. The pink color was cut by the green color of sakura trees that already shed its flowers. The flowering this year was better compared to last year. I have to be careful here! Standing in the middle of the road was a bit dangerous because of passing cars. It was another great day for cherry blossom viewing. The humble beginnings of the luomujie blog's Sakura Series started in Yinghua Park and I will never forget my trip here. A ordinary park planted with native cherry blossoms of Taiwan, locals come here to greet the opening of the island's sakura season. Just like New Garden City, it is located in Wulai District and also close to Wulai. The flowers appear during the late-January and early February. It would be a triple treat if you will visit Yinghua Park, New Garden City, and Wulai in one day by tripool taxi. How to get here: From MRT Xindian Station, board Bus 849 and then alight at Meihua Lake (梅花湖 ) bus stop [Google Map]. How to get here: Board the Taipei MRT. Alight at Tamsui Station and transfer to Bus 862, 863, 865, 867 and 892. Get off the bus at Xīnzhuāngzi (新庄子) and walk for 290 meters to reach the entrance of the Sansei Trail. Status of flowering during my visit: 60-80% of the flowers have opened. Leaves can be seen on some branches. A school campus becomes a tourist attraction in Taiwan when showa cherry blossoms and other sakuras blossom every mid-March. National Taipei University with its main campus in Sanxia District is a secret spot to see cherry blossoms. Visitors wishing to see to get the most out of their visit must go in the morning, around 10 am to get the best pictures of the trees. Anyone can enter the campus without the need to show an ID card. 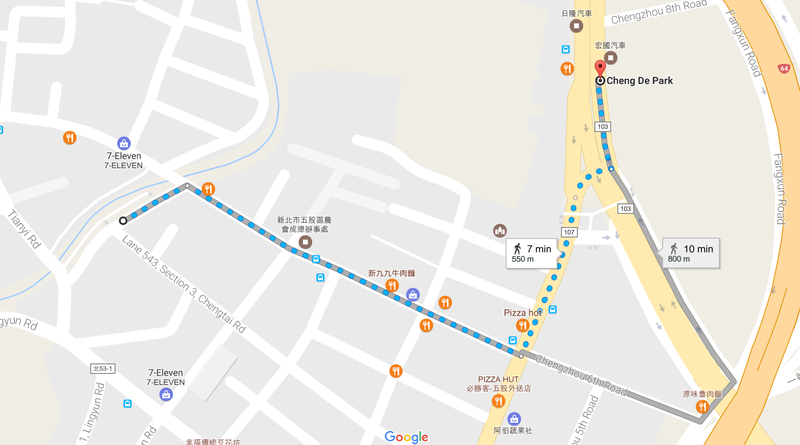 How to get here: Board Bus 916 from MRT Yongning Station (Blue Line) and alight at National Taipei University (Sanxia Campus) [臺北大學(三峽校區)] [Google Map]. Start searching for the cherry blossom at Yuanfei Blvd. [Google Map] inside the campus. Taiwan's silicon valley should not be left out when it comes to cherry blossom viewing. Similar to Miaoli, most of its sakura trees are growing on the mountainous regions. Tourists must set a big amount of money just to get there by private car. But there is one lone bright spot and I'm very sure that this is a very easy place to visit. Just a walking distance from TRA Hsinchu Station is a park that is glowing and blooming every spring. The cherry blossoms there glow against the darkness like the stars at night. Status of flowering during my visit: Blossoming was not good. Most of the trees already have leaves although some buds of the cherry blossoms are yet to open. The park was alive at night because of the cherry blossoms. ... but seeing the flowers will make you forget about the shades of green on the tree. A visitor takes a photo of the cherry blossoms with her smartphone. The flowering last year was better but this year was still good enough to appreciate sakuras in Taiwan. The light illuminates the pink color of the cherry blossoms. Professional photographers taking good photos of the sakura tree. The province of Miaoli is not known to be a sakura hotspot and whenever I heard of the place, I only think of three things: 1) you can pick strawberries there, 2) do woodwork in town of Sanyi and 3) feel farm life at Flying Cow Ranch. Often bypassed by travellers, because a lot of tourists chose to visit first Taichung. Miaoli has a lot of offer that will international visitors will love to visit. In 2018, I visited one for the Sakura Series and it was a very interesting park. Orange vs pink. A war is happening in Taiwan every spring. It's a battle between the warm color of the firecracker flowers versus the cheerful aura of the cherry blossoms. Which flower will reign supreme? Which blossoms will be hailed as the queen of spring? Let's find out. Haha! The arena can be found in Tongluo Township in Miaoli province. A quiet town where no one expects a fight between two things. In a road where vehicles of the Hsinchu bus company pass by, a hill can be found and it is usually covered with green leaves. There was nothing special here except that one can see a town and its dry river from an observation platform. Every spring starting in January, a magical event happens. The once covered roadside suddenly changes in color. From green, it forms patches of orange. The transformation is so amazing that little by little flowers sprout on each vine, which had been hanging on the wall for a long time. At this phase, the battles starts to begin when the firecracker flowers invade the Huanbao Park. Not long after, the sakura trees above the hill will show its buds, taunting the firecracker flowers in a duel. With the right weather conditions, the mountain cherry blossoms will attack the place in a blitzkrieg fashion, much to everyone's surprise. At full bloom of our beloved sakuras, the firecrackers have also formed a great wall along the roadside. Pink vs orange. Cherry blossoms vs firecracker flowers. Expect an exchange of petals as each flower dominates their respective areas. Above the hill are our mountain cherries while down below the hillside are the orange ribbon-like blossoms. It's a competition! A quest for supremacy under the shining sun. My verdict? People come here to see the cherry blossoms with the firecracker flowers as an added bonus. So the winner? Team sakura! The only landlocked province of Taiwan is home to a thousand or even more cherry blossom trees. Central Taiwan won't be complete if you don't mention Nantou. Who would ever forgot Cingjing Farm and Hehuanshan? Taiwan's top attractions are here and visitors often go to the largest alpine lake of the island which is called Sun Moon Lake. Literally and figuratively, the heart of Taiwan has two of the best places to see cherry blossoms. I was skeptical at first, if it can give me my money's worth, so I visited them to see for myself. And I was totally surprised! Because Nantou's Sun Moon Lake Ropeway and the Formosan Aboriginal Culture Village can challenge the Wuling Farm Cherry Blossom Festival. There are still other sakura viewing spots that are just waiting to be discovered by foreign visitors. Two of them are now featured on this ultimate cherry blossom guide. A tea plantation located near Yushan National Park. Mystique, magical, mysterious. I thought I have seen all of Taiwan. But I was wrong! Caopingtou is a wonderland for those who are always seeking new places. I will never forget the first time that I've been to this place. I think the right term for this place is a neverland. Haha! Bus 6739 from Sun Moon Lake's Shuishe Visitor Information Center leave twice a day to go to Alishan every morning. One of its stops is Caopingtou. Tourists are required to buy tickets before boarding the vehicle so that they will be given priority on the queue. Once those with tickets have already entered the bus, EasyCard holders can now enter provided that there are seats left. Arriving at the gate of the Capingtou tea plantation, visitors will have to pay the entrance fee of NTD 50. A lush greenery with patches of pink. During my visit, the mountain cherries were almost in full blossom and visitors can't stop themselves from taking pictures. To get the most out of your trip, you will have to explore the entire tea farm. You will not only see the mountain cherries but you will also the pink flowers of the kawazu sakura. Adding more drama to your Taiwandering are the white flowers of the so-called “lihua”. They are called pear blossoms in English and seeing them in great numbers is something that you would only see in Caopingtou. Lihuas formed a cluster of flowers that almost makes a ball, and sometimes the entire branch will be covered with white petals. On one section of the plantation is a lihua forest and I saw locals enjoy their hotpot under the flowers. Aside from the lihuas, there were also pink blossom, although they weren't that many. Peach blossoms are another reason to visit Caopingtou. At the time of my visit, only a few flowers have opened. It would be great if all of the buds were full open. Caopingtou is one of those sakura viewing spots with the longest time frame of flowering. The variety of flowers that you see here makes the place so special. It is also one of the few places in Taiwan to hold their cherry blossom festival in January that is almost of the same thing with Taipei's Pingjing St. Lane 42. The reddish petals of the mountain cherry blossom at these time, and on March the Japanese varieties will take their place to welcome the visitors until the entire sakura season ends on mid-March. Price comparisons of one-way fares in tripool taxi going to Caopingtou. Up to a maximum of 8 passengers can be book in one ride. My only problem here was the lack of shuttle buses to take visitors from the city proper of Nantou to Caopingtou and back. Most people come here with their own cars and relying on the public bus is a bit stressful. The vehicle easily gets full with passengers that you will have to stand if there were no seats left. What's worst is that the bus stop in Caopingtou has no signs to remind visitors of the bus timetable. It is just handwritten on the walls of the waiting shed. Don't expect also people to speak English here. This is not Taipei, but on the farthest town that you will ever know. It's just a few hours of drive from Alishan. Haha! Zhushan Township is proud to have the Shanlinxi Forest Recreation Area. Famous for its dawn redwood forest and its maple foliage during autumm, it is also secret spot to enjoy sakura. Most people in Taichung and Nantou think of going to Wuling Farm in mid-Feb, little that they know there is an easier place to visit just to see cherry blossoms. Fortunately for the residents of Central Taiwan, the predicted blossoming of the flowers will fall on early March to mid-March, so they can both places once the spring season heats up. I have made a very detailed post on how to go to Shanlinxi and discussed on which corners of the park the maple trees can be seen. Readers of the luomujie blog, can go to the Maple section of the website and choose Shanlinxi to know more about this place. Aside from the cherry blossoms, every spring Shanlinxi holds a tulips festival. It will be a double treat for tourists if they visit on the right time. They would see a variety of bulb flowers plus the pink petals of the sakura. 1. by bus: At the Taichung Yuanlin stop, board Bus 6871. Get off the at the terminal which is the Shanlinxi Forest Recreation Area. The bus fare cost NTD 281 for a one-way ride. When the vehicle reaches the toll gate of the scenic area, a park representative will enter the bus to collect the adult entrance fee worth NTD 250. Price comparisons of one-way fares in tripool taxi going to Shanlinxi Forest Recreation Area aka Sun Link Sea Forest Recreation Area. Up to a maximum of 8 passengers can be book in one ride. From mid-February to mid-March, selected places in Taichung become filled with the pink petals of the cherry blossom. Heping District's Wuling is the most popular and considered to be the best place to see the sakuras. For travellers, who don't have the luxury of travelling for about 6 hours from downtown Taichung, they can always go to these alternative cherry blossom viewing spots every spring. How to get here: Board a local train of the TRA and get off at Tai'an Station. Travel time from Taipei is 3 hours. At the time of our visit, free shuttle buses were provided but it was until March 5 only. For visitors who wish to see the yaesakuras here, they will have to walk for 1.4 kilometers to reach the police station. Price comparisons of one-way fares in tripool taxi going to Taian Police Station, Dajia Precinct, Taichung City Government Police Department. Up to a maximum of 8 passengers can be book in one ride. The sakura trees are planted around the compound of the police station. Traffic control was being implemented at Anmei Road. A pet owner brought his dog and put shades on the animal for a picture perfect post in front of a sakura tree. Yaesakuras are very common in Taichung especially in Xinshe District. Imagine parking your car beside cherry blossom trees. Travel Buddy Teklu, the yaesakura and the head photobomber. Haha! The wooden fence made the place more scenic.